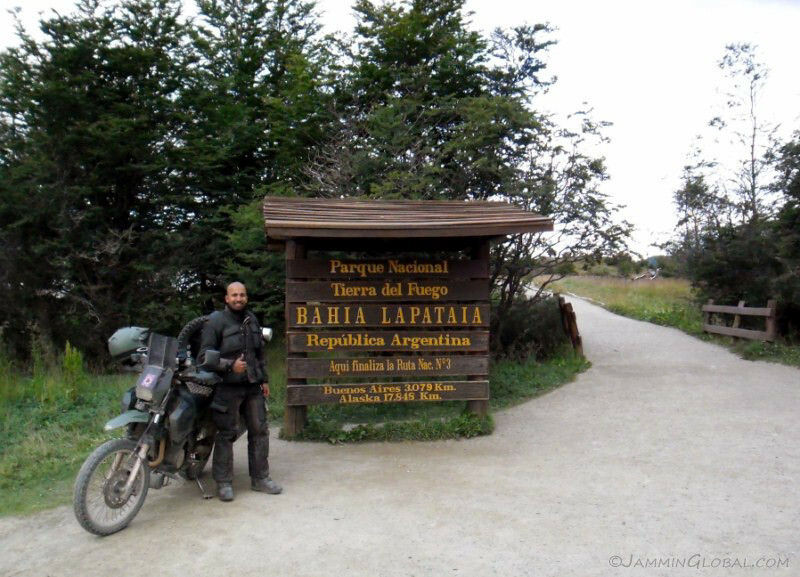 I had reached the southern tip of the South American continent. 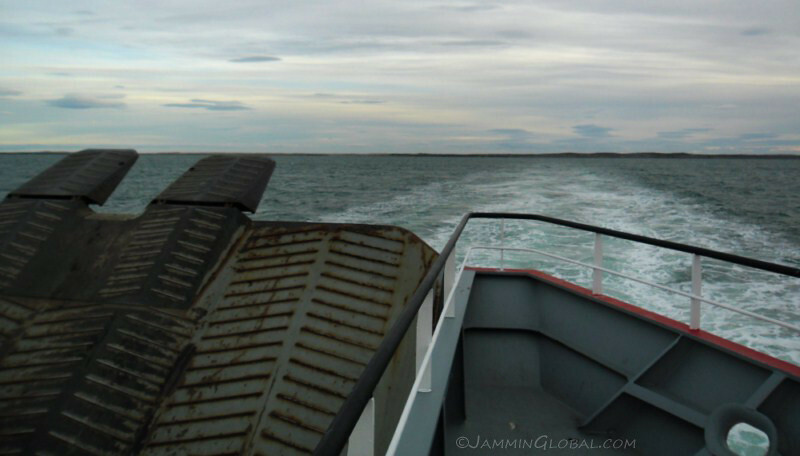 With a short ferry ride across the Straits of Magellan, I would finally be in Tierra del Fuego. This name has been etched in all overland travelers’ minds as one of the distant ends of the world. lt also serves as a symbolic and literal turning point since the road doesn’t go further south. After a few days on this island at the end of the world, I started my journey back up north to Buenos Aires to finalize my exit plans from Latin America. 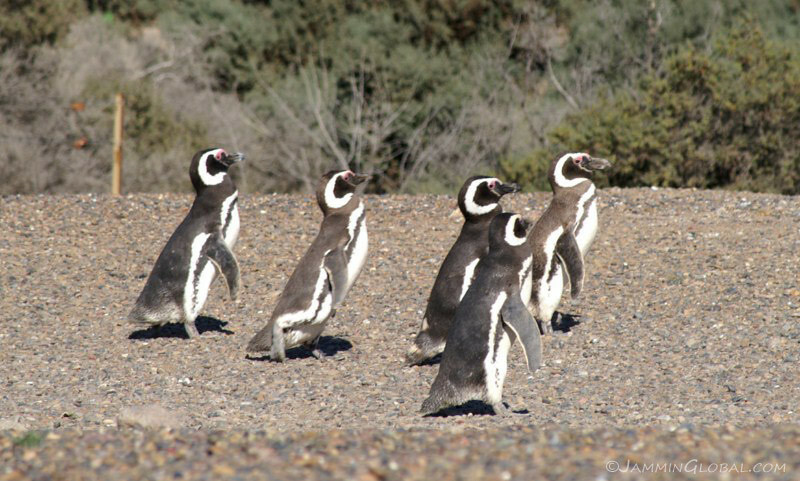 On the way up, I stopped in to see the charming penguins at Punta Tombo. 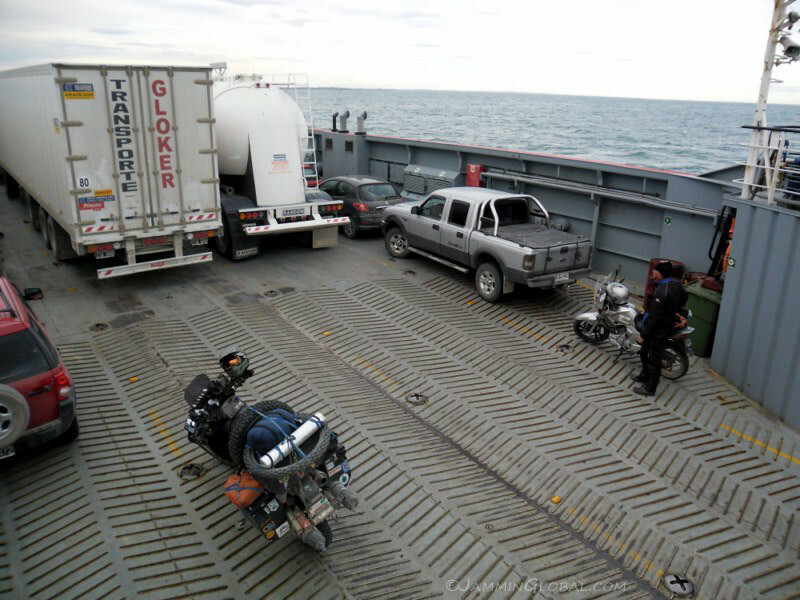 Heading north 164 kms (102 mi) from Punta Arenas, I arrived at the short (free) ferry across the Straits of Magellan over to Tierra del Fuego. 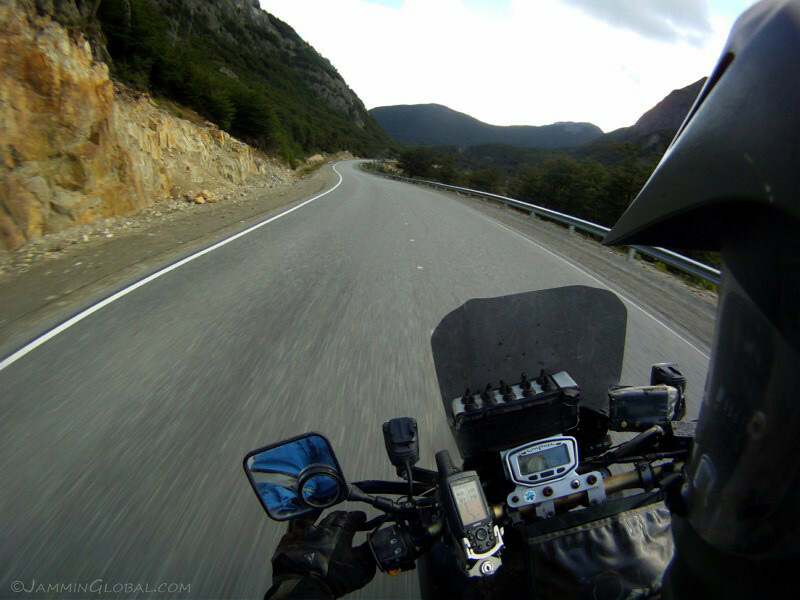 Coming up this way from Punta Arenas to the border at San Sebastian makes it a 305 km (189 mi) journey. 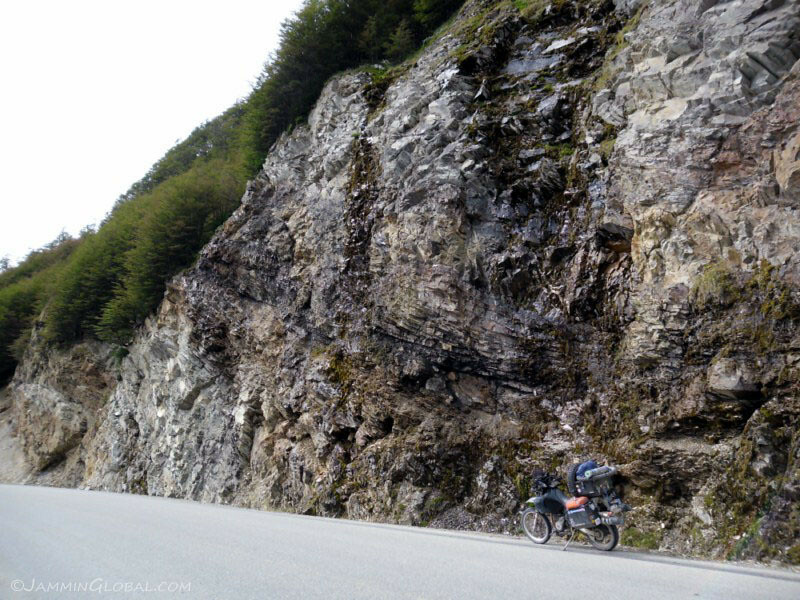 There’s a shorter route with a ferry costing US$70 going from Punta Arenas to the town of Porvenir across the straits, and that journey to San Sebastian is about 145 kms (90 mi). Besides the cost, I chose the longer road route since that ferry runs more frequently across the narrowest part of the straits. The ferry to Porvenir runs only once a day. A map of my route around the southern tip of South America. Click on it to go to the interactive version in Google Maps. 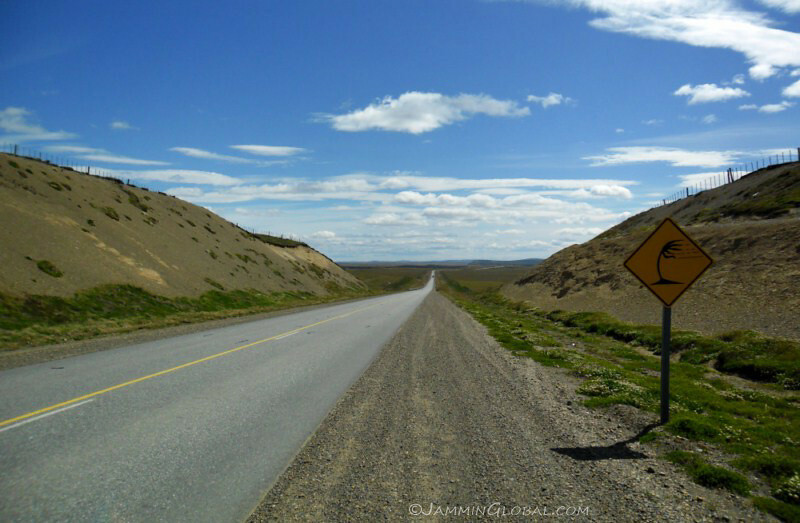 To get to Ushuaia, which is in Argentina, the road crosses through Chile and there is no direct link between Rio Grande and Rio Gallegos. 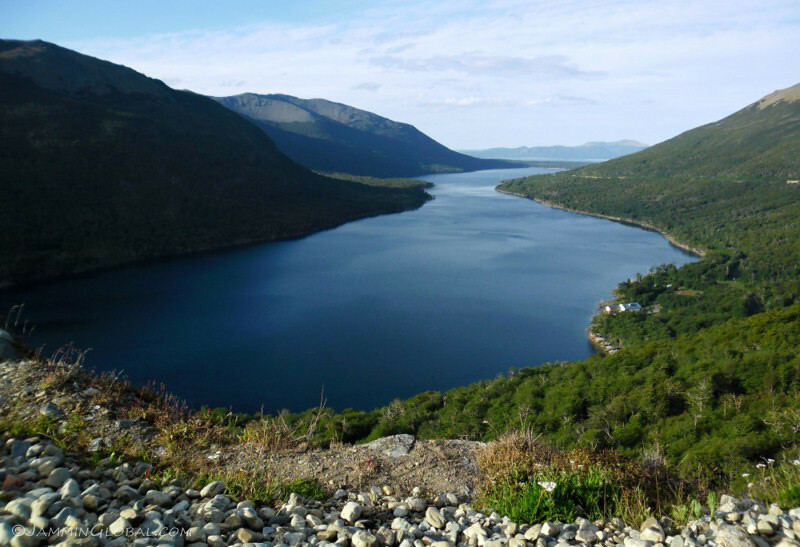 Tierra del Fuego is considered an island since the water body of the Straits of Magellan separate it from the mainland continent. After numerous border conflicts between the two nations (resembling India and Pakistan; artificial conflicts between the same people), they’ve split Tierra del Fuego down the middle. 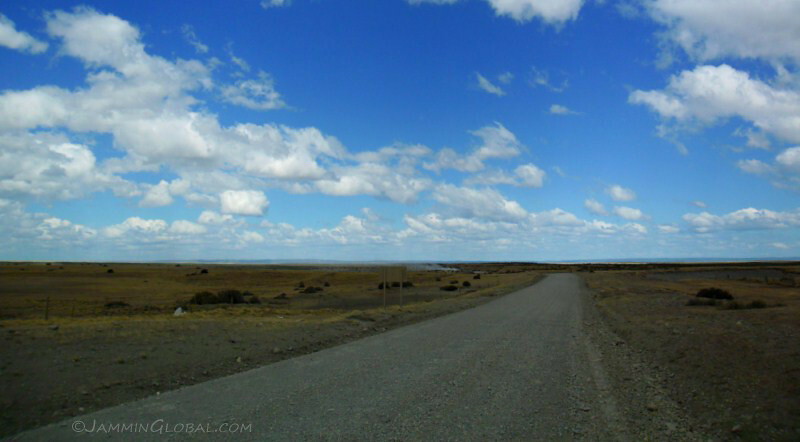 If you look near El Calafate, there’s a section of the border that has not been agreed on and is still being arbitrated by the UN. It’s a section that’s under the Southern Patagonian Ice Field and with the animosity between these two countries, it probably wont get settled until the ice melts. 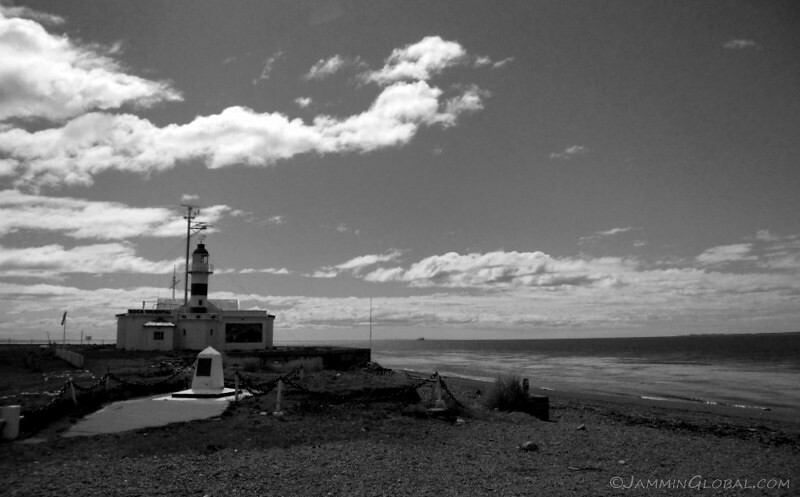 The Faro Punta Delgada (lighthouse) at the western end of Bahia Posesión, marking the entrance to Angostura Primera, the first narrow section of the straits. This must be a welcome sight for sailors in the fog. Fernão de Magalhães, in service to the Spanish King, was the first European to navigate these waters in 1519 on his circumnavigation voyage. Besides getting these straits named after him, he also has a GPS brand to his name. 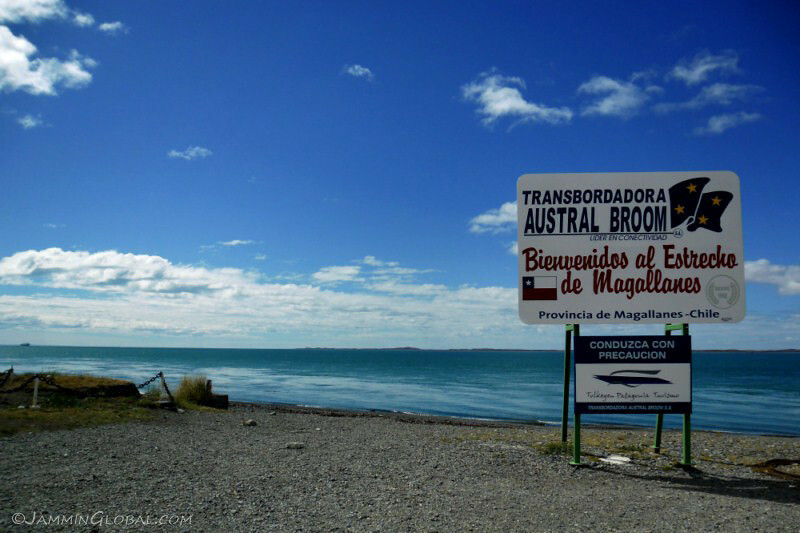 Just to get our geography down, the Straits of Magellan separate the South American mainland from Tierra del Fuego, with Punta Arenas as its biggest settlement. Then, there’s the Beagle Channel, with Ushuaia on its shore, that separates the Isla Grande (big island) of Tierra del Fuego from smaller islands to the south and then past Cape Horn (the last piece of the land considered part of the South American Continent lies the Drake Passage with Antarctica on the other side. Of all these, the Straits are the calmest to navigate from the Atlantic to the Pacific and the Drake, the biggest for commercial ships, mainly those classed as Post Panamax (oil and gas tankers too wide for the locks at the Panama Canal). The ferry makes the crossing in about 20 minutes, arriving at Bahia Azul on the other side. The appeal of riding to the ‘end of the world’ seems kind of lost nowadays when tour buses and family sedans are part of the traffic. I was told we would need to pay for the ferry at some point, but no one asked for any money. The straits are calm these days (besides the wind), but there was a lot of conflict about who owned this prime marine route in the 19th century, with Chile establishing Punta Arenas to put its foot down on ownership and keep the British, French and Americans away from occupying it (like they did in Panama for the canal). 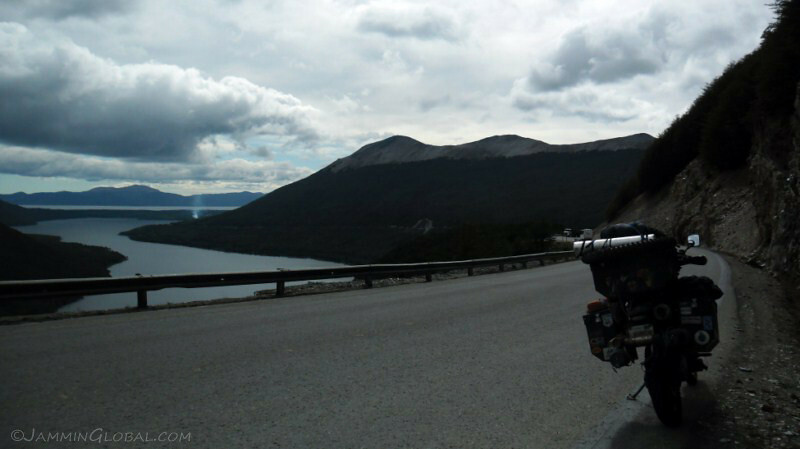 Welcome to the island of Tierra del Fuego. I’ve been saying this name for the past 4 years and to finally see a signboard with those words was quite the occasion. But instead of the image of a distance, rustic land that I had, it was a brand new concrete road with a mega sign. Oh well, can’t stop development just for our romantic notions. 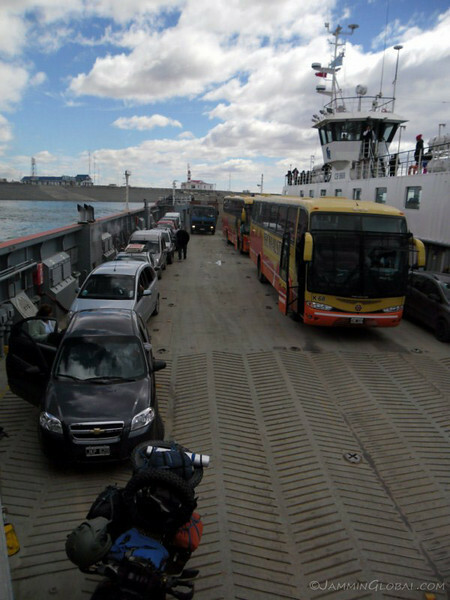 As soon as the gate dropped from the ferry, it felt like a sprint race from all the eager Argentines behind me. I let them pass to savour this moment. 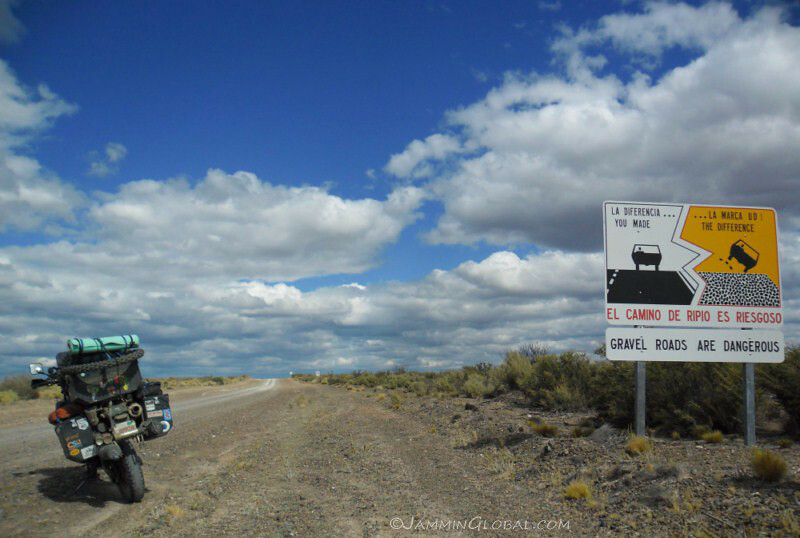 The route is only paved for the first 30 kms, till the small town of Cerro Sombrero, then it’s a flat and gently rolling 110 kms (68 mi) of dirt to the last border with Argentina. 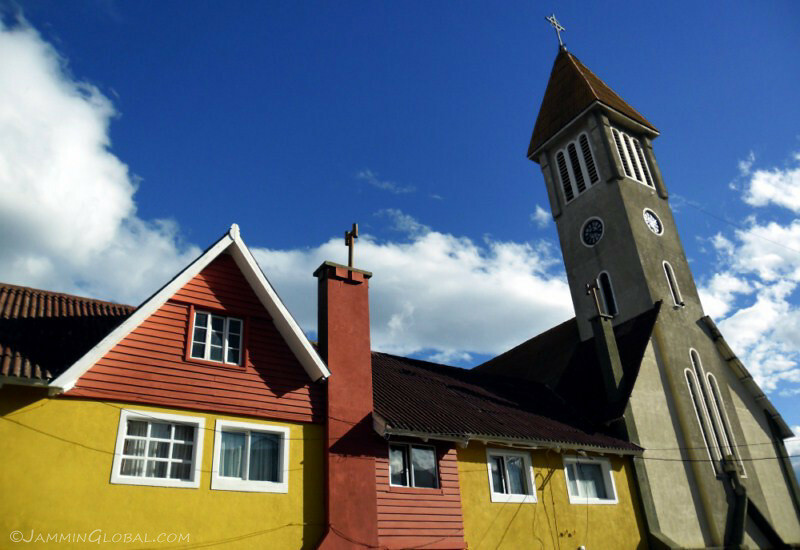 The name Tierra del Fuego translates as ‘land of fire’ since that’s what Magellan saw due to the constant fires that were lit by the native Yahgan people to keep warm in this chilly land. Surprisingly, the Yaghan did not wear clothes and managed to survive here by huddling around fires and smearing themselves in animal grease. Over time, they developed higher metabolisms and were able to generate more internal body heat than the average humans. Their numbers dwindled with the arrival of European settlers and the diseases they brought with them. Arriving at Paso Fronterizo San Sebastián and this is the only border that I came across where it’s paved and more developed on the Argentine side than the Chilean side, since the Argentines have a bigger population with larger settlements than the Chileans on this island. The wind was blowing strong here. 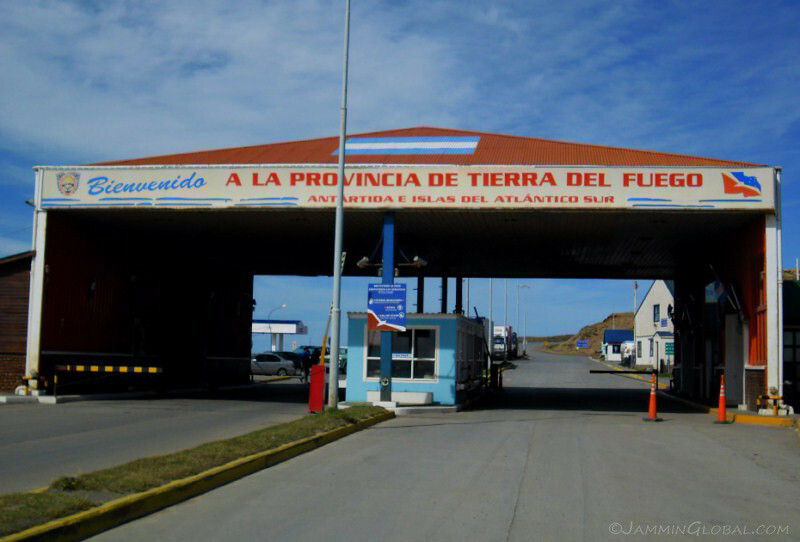 From the border, it’s a short 87 kms (54 mi) of tarmac, along windswept vistas of the ocean till the city of Rio Grande (and cheap Argentine petrol). 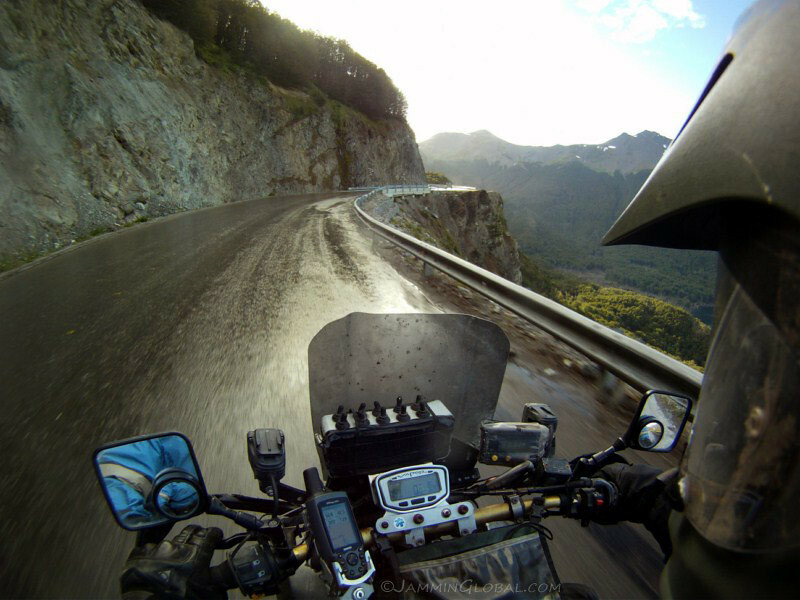 Ruta 3 flows over the gentle land south of Rio Grande, passing thru evergreen forests, but it’s the last 100 kms (62 mi) from Tolhuin to Ushuaia that makes for an exciting ride as the route climbs up and over the Martial Mountains with Cordillera Darwin to the west on the Chilean side. 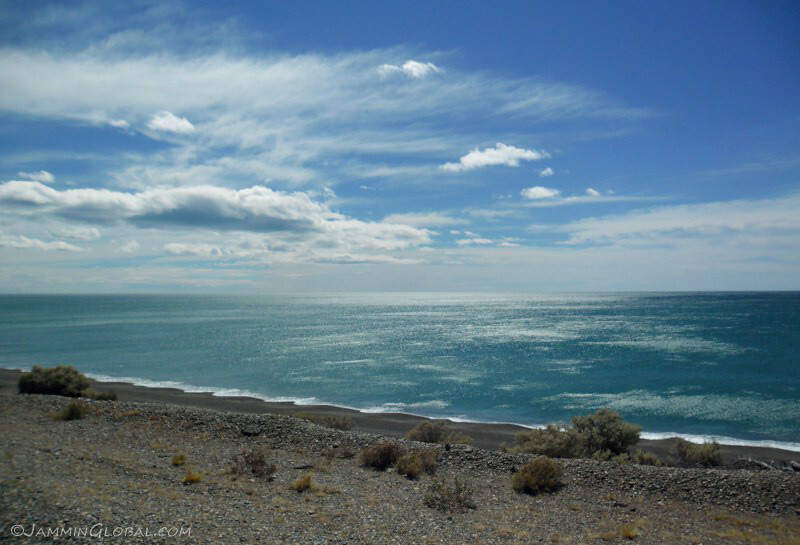 This range stretches east to west across the island and marks the southern end of the Andes. Tolhuin is at the eastern end of the 98 km (61 mi) long Lago Fagnano. I see it! Almost there. Another 24 kms (15 mi) west of the city lies the actual end of the road at Bahia Lapataia. All the road signs has splits in the middle, I think to allow less resistance for the winds and prevent the signs from being blown down. It was relatively calm, but getting chilly and I saw rain clouds ahead. The route started twisting and climbing and I was feeling good with sanDRina to be so close to Ushuaia. 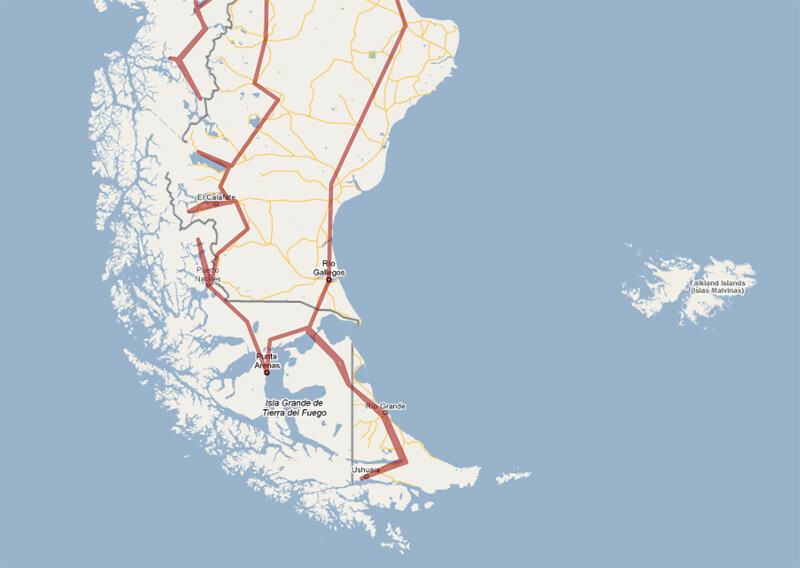 Ruta 3 is the main route on the Argentine side of Tierra del Fuego, with Ruta 40 ending near Rio Gallegos on the mainland. Looks like I just missed the rain with the sun already coming back out. My rear tire was getting thin in the middle and I took it easy through the wet turns. The still, steel blue of Lago Escondido (Hidden Lake) near the summit across Cordillera Martial, looking north. 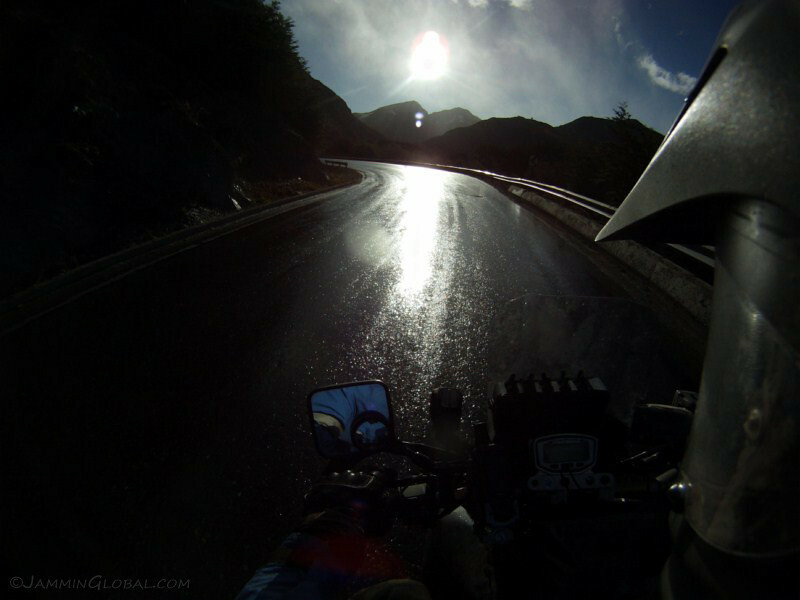 As I crossed Paso Garibaldi, at an elevation of just 430 m (1,410 ft) the weather was quite rough with sheets of rain falling like blades of ice and the low sun, reflecting off the shiny road surface directly in my face, made it a tough section to manoeuvre through. However, the sun visor of the Arai XD did its job of blocking out El Sol. It’s only been caught once or twice in the fierce winds of Patagonia and I believe the daily benefits it offers in terms of protection from the sun far outweigh the few times it might be tugged in the wind. 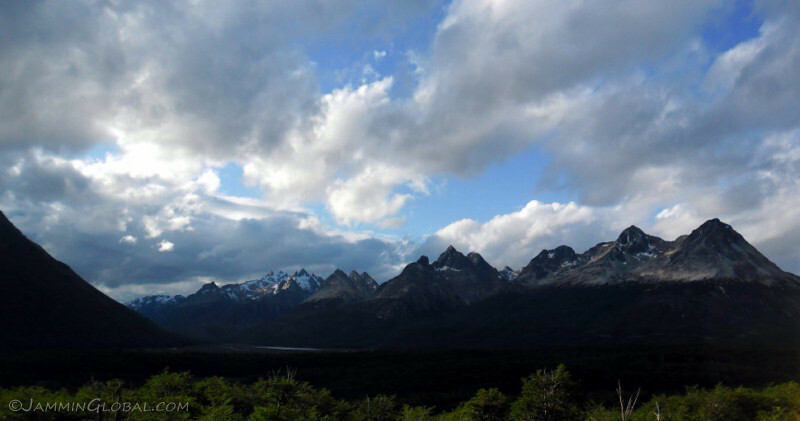 The sharpness of the peaks of these mountains is quite dramatic compared to the steppes of Patagonia to the north of the island. The road drops back down from the pass into the valley that leads to Ushuaia. I was surprised to see such sharp-peaked mountains in this windy area, that too with snow and ice adding to the erosional force. Perhaps they’re just pure granite and can withstand the test of time. They’re not that tall with an elevation of only around 700 m (2,300 ft), but height has nothing to do with how enigmatic a mountain can be. 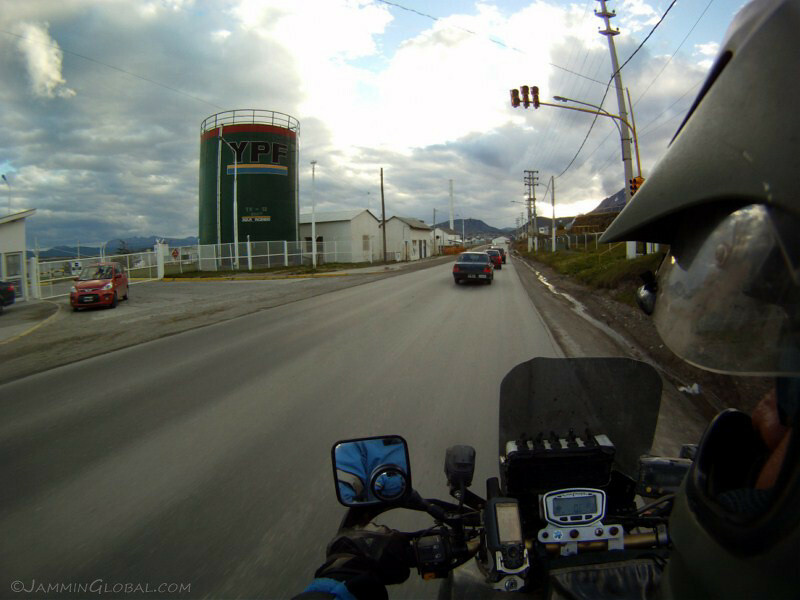 And voila, I’ve arrived at Ushuaia, La Ciudad Mas Austral Del Mundo (the southernmost city in the world). To be honest, it didn’t really feel like an accomplishment (except maybe for the geographer in me), but just felt like another city along my route. 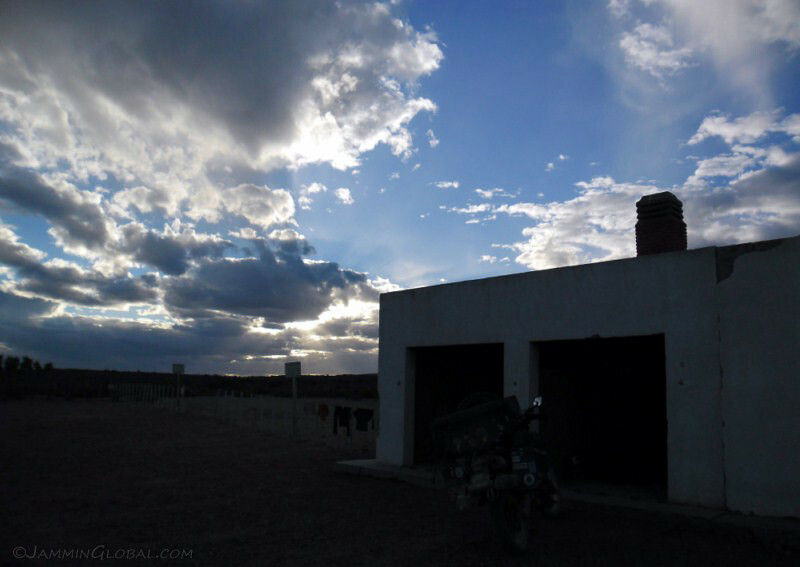 I think after seeing the numerous mind-blowing sights along the Andes, just getting to a town at the end doesn’t really light the fire. The mural depicts the penal colony that was setup here in the late 19th century to replicate what happened in Australia’s Tasmania and France’s Devil Island, whereby the isolation of the place thwarted any escape attempts. The prisoners were in essence, forced colonists, since the Argentine government used them as citizens to increase their numbers on this hot territorial land. 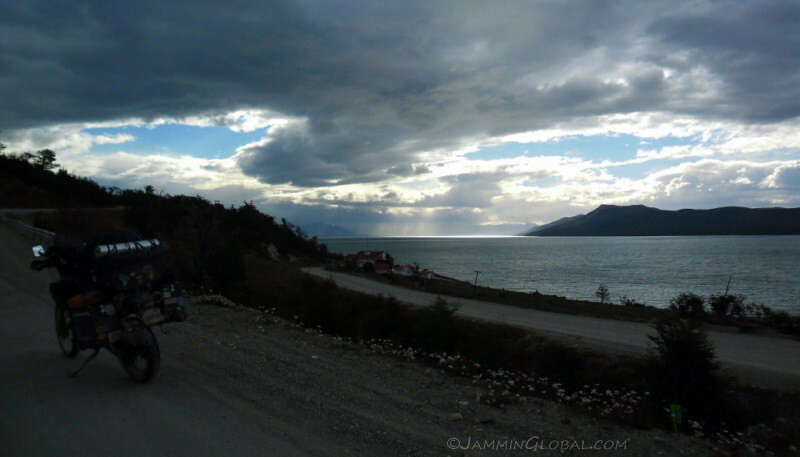 Besides its significance on a map, the location of the settlement is quite impressive on the shores of Bahia Ushuaia along the Beagle Channel, under the gaze of the Martial Mountains. The town certainly has an ‘end of the world’ feel to it, but with a resident population of around 63,000, normal life carries on as I pass thru this new sub-division where the road was still being laid. There’s even a television assembly factory in town but the main sources of income are still tourism and gas and oil exploration. Oh yes, the all important gasoline that keeps any human settlement chugging along, especially remote ones such as this one. YPF is the national petroleum company. Another view of the city rising up the flanks of the Martial Mountains. 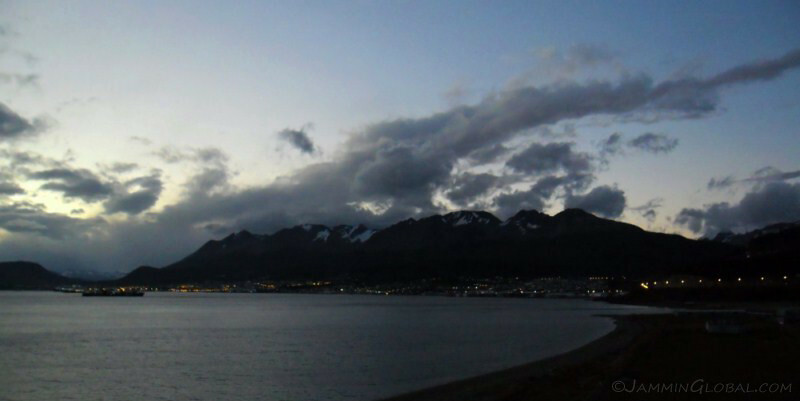 The wide expanse of Bahia Ushuaia in the Beagle Channel. 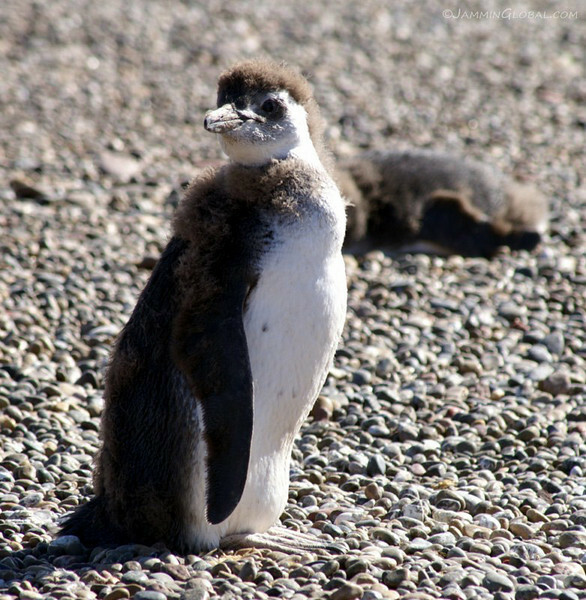 It is named in honor of HMS Beagle, the ship that carried Charles Darwin to these parts of the world in the years that he started formulating his Theory of Evolution. The mountains on the other side are on Isla Navarino in Chilean territory with two more towns of Puerto Williams and Puerto Toro, all vying for the title of southernmost city of the world. However, the first has less than 2,000 inhabitants and the last has just a few families, so I think Ushuaia, being a proper city, still retains the title. I stayed with Ricardo thru CS who travels back and forth between Buenos Aires and here, transporting construction materials. 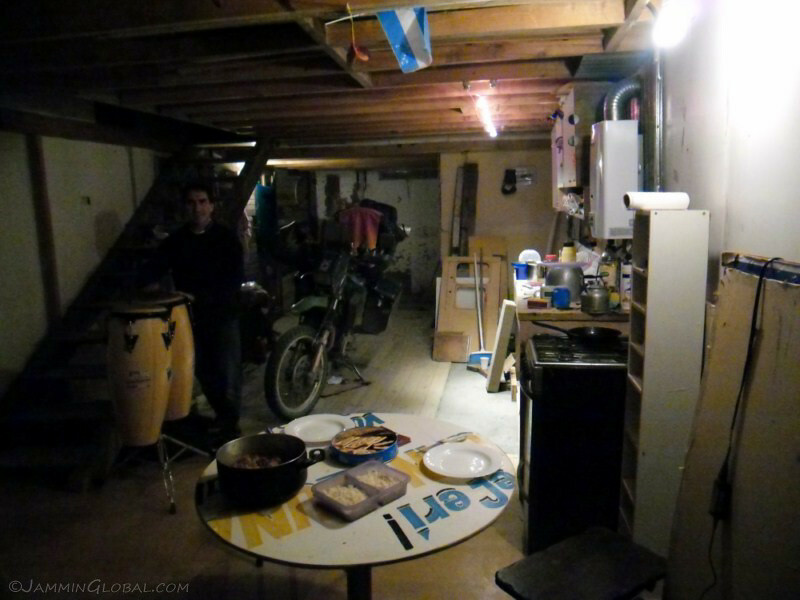 He recently bought this old house and is in the process of renovating it. 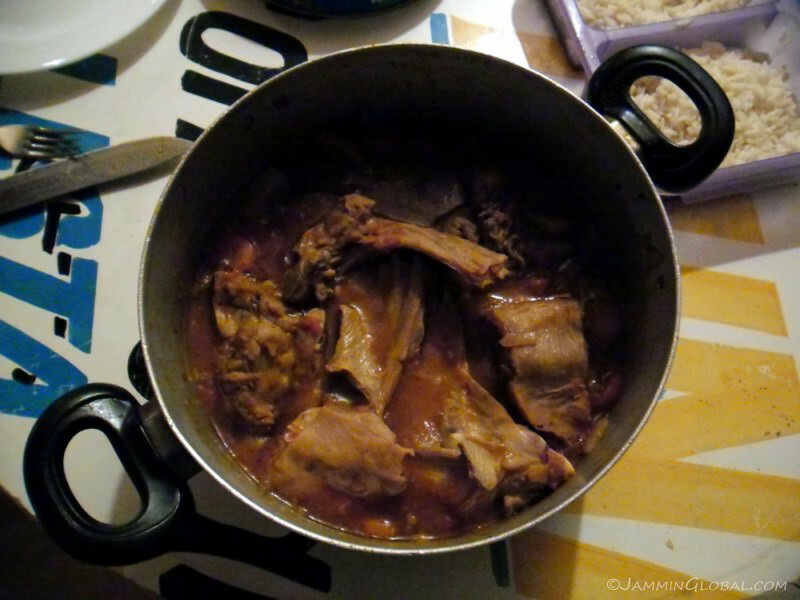 He made this tasty lamb dish, since that’s the primary meat of the area, even though all Argentine’s still prefer beef. However, everyone’s been telling me that prices for beef have been rising steadily and they are looking at lamb more and other meats. I think the popularity of Argentine beef abroad is limiting supplies for domestic consumption, leading to the higher prices. Sheep produce less methane than cows, so I’m all for encouraging more lamb and mutton than beef (methane is 20 times more harmful than carbon dioxide to our atmosphere). Did you know that scientists are thinking of adding turmeric and coriander to livestock feed to reduce the amount of methane that they produce? Believe in the power of curry! Ricardo’s classic Fuegian house, narrow and long. 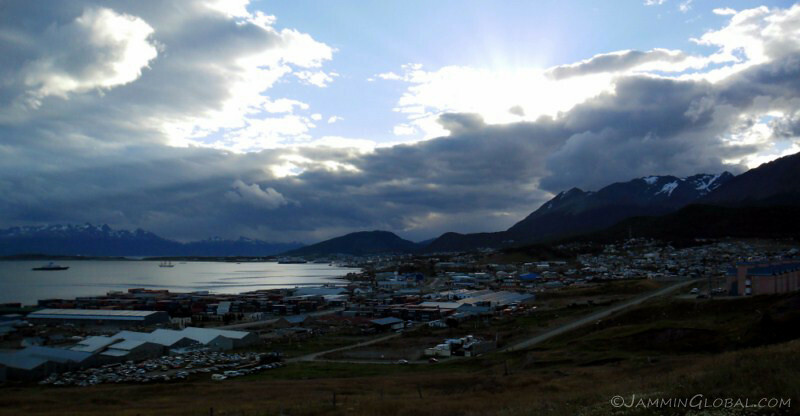 The area of Ushuaia has been inhabited since 10,000 years ago when the first natives of the Yaghan people arrived here, descendents of the humans that crossed the Bering Strait during the last ice age and made their way down the Americas. Their numbers declined as British missionaries tried to ‘civilize’ these savages and inadvertently introduced the diseases of Europe to this land, for which the natives had no immunity. In a strange social experiment, three natives were taken by Captain FitzRoy to teach these people the civilized way of modern life in London, which they picked up with ease. They returned with Charles Darwin a year later and shockingly to the British, quickly discarded everything they had learned and went back to their old ways. 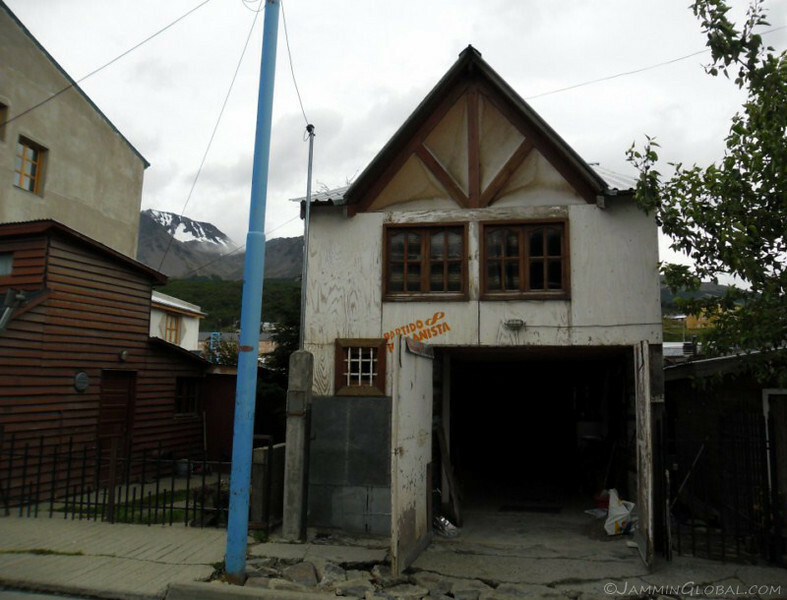 An abandoned building in Ushuaia, up for auction. I made it. 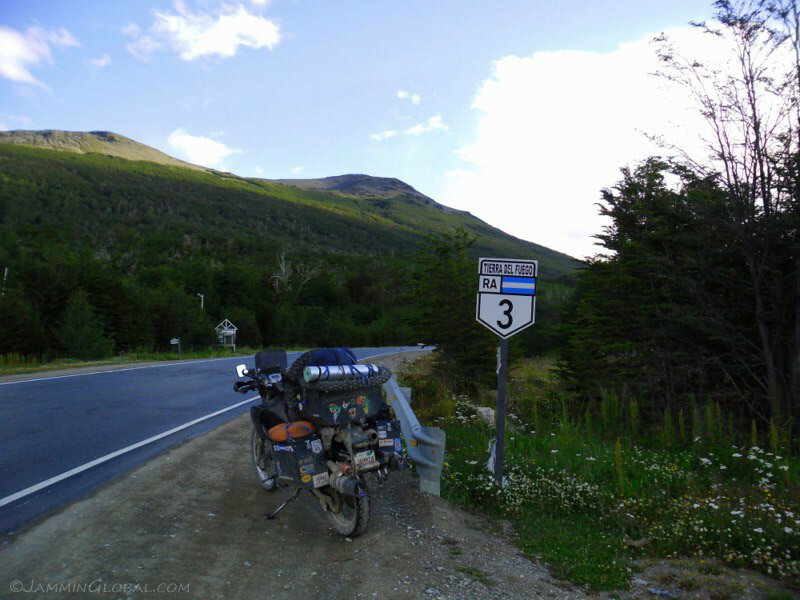 Prudhoe Bay to Ushuaia in about… three years (I went to Alaska in 2008). 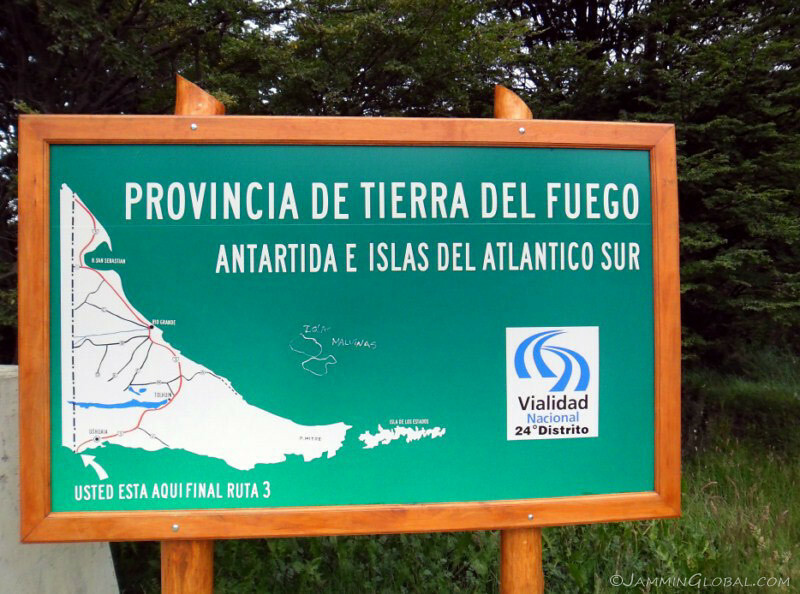 25 kms (15.5 mi) west of town lies the Parque Nacional Tierra del Fuego (P65 entrance) and the road officially ends at Bahia Lapataia. Ok, time to turn around and head north. Bahia Lapataia. This is what the end of the world looks like. Not bad. 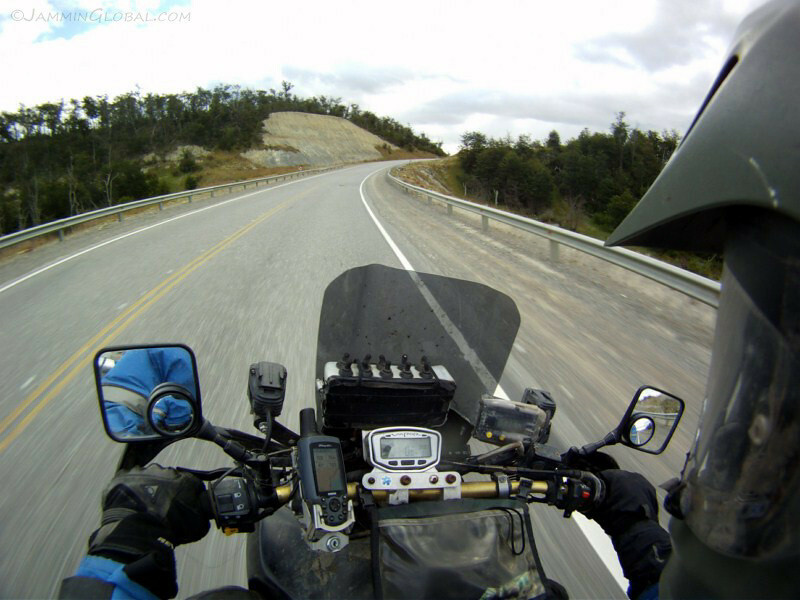 The GPS reads 54.5 degrees south and on the other side of the equator, this same latitude would fall only about halfway up British Columbia with Prudhoe Bay, on the northern edge of Alaska at near 70 degrees. Because of this, a lot of people have asked me if Alaska is terribly cold, seeing how much closer it is to its pole than Ushuaia is and they’re surprised when I say it’s actually much warmer than all of Patagonia (that is only during the short summer). The difference is that, just a 1000 kms (620 mi) south of Ushuaia is the massive frozen continent of Antarctica, the source of all the freezing winds here. There is the ice cap on the North Pole, but it’s much smaller than it’s counterpart in the south. 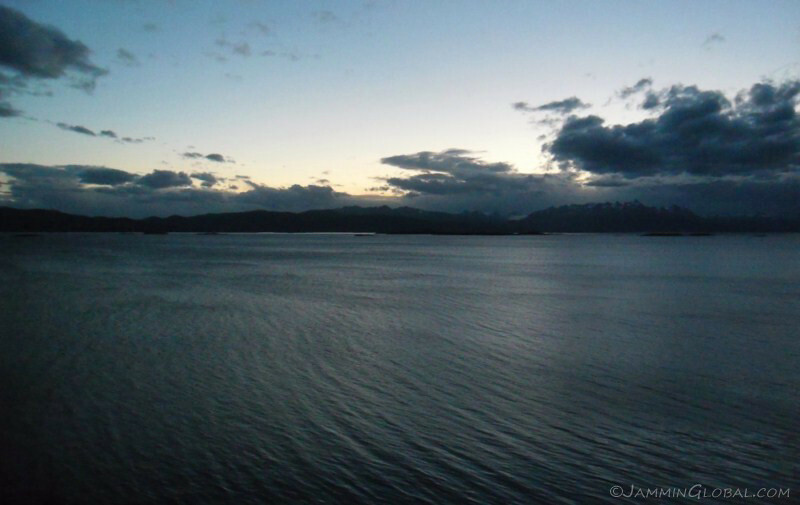 A more enchanting view of the Beagle Channel from Bahia Ensenada. 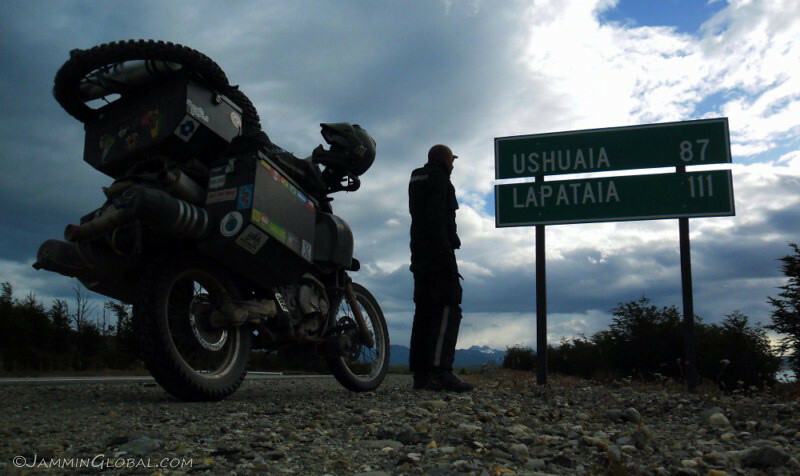 After enjoying the sights around Ushuaia, I started my journey north. 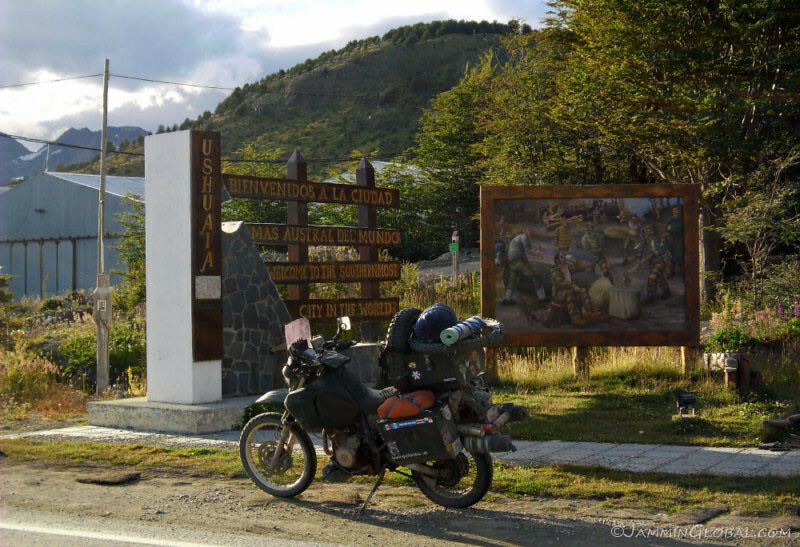 This is just past Paso Garibaldi and this also signifies the last time that I would ride in the Andes on this trip, having first climbed up into them near Pasto, Colombia. Looking out over Lago Escondido with a fire burning in the distance. Hmmm, so this is Tierra del Fuego after all. 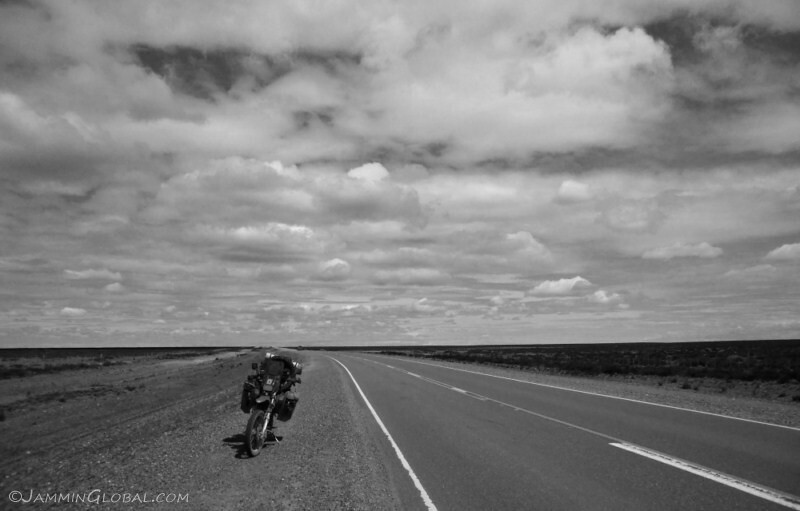 A few kilometers past Tolhuin, I heard a crunching sound coming from the rear wheel and this time, I knew what it was immediately – a rear wheel bearing failure, exactly what happened 29,800 kms (18,500 mi) ago south of Cusco in Peru. And it was the same bearing that failed, the one on the rear brake rotor side. 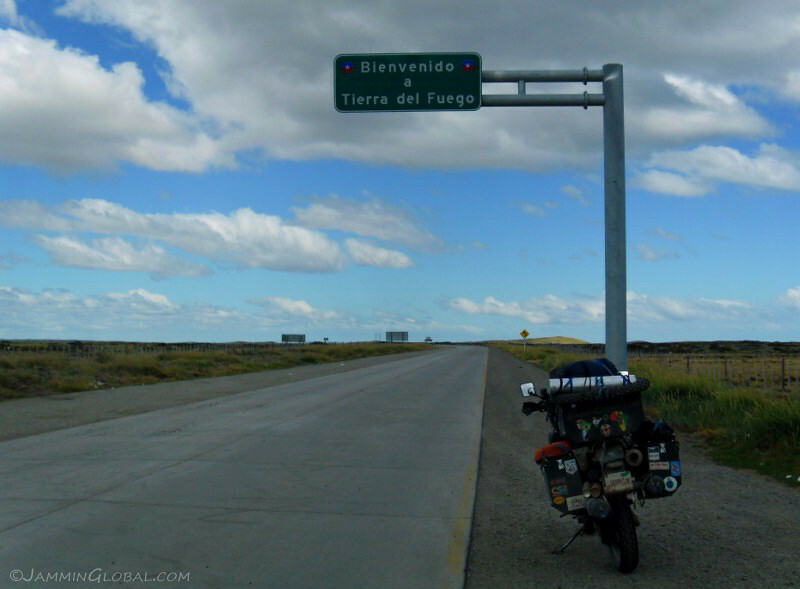 I guess that’s not a bad mean time between failure (MTBF) considering I rode the TransAmazonica in Brazil, then the Lagunas Route in Bolivia and miles and miles of washboard and gravel down Ruta 40 and the Carretera Austral, that too with my heavy luggage. I am still wondering why it’s only that particular bearing that has failed twice now. 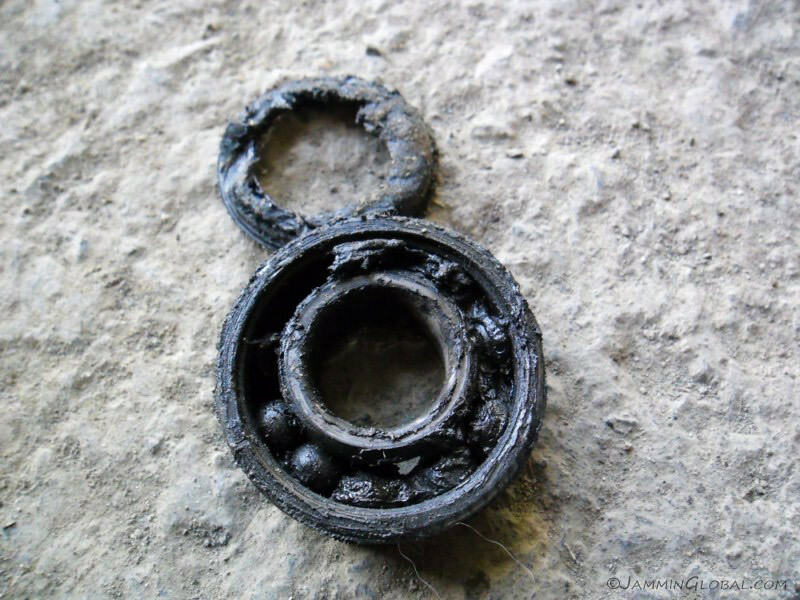 This was an SKF bearing and I guess I can’t bad mouth the All Balls bearing that I initially had in there, but that failed much before the SKF and that too over mostly tarmac riding, so I’ll still stick with SKF bearings. 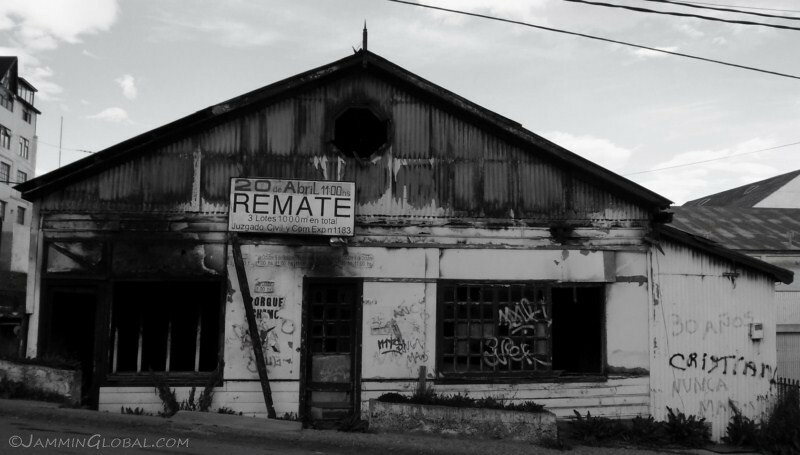 I limped the few kilometers back to town and found an automotive shop. 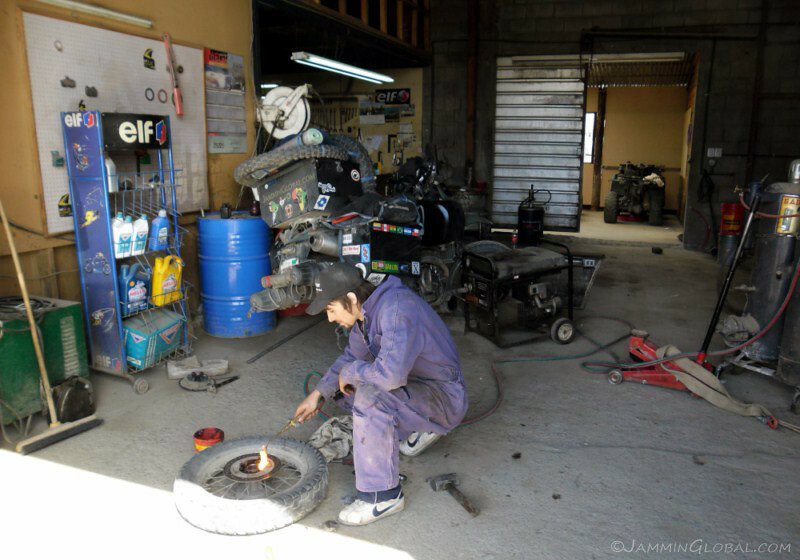 This young mechanic was hesitant to help me out since he said he didn’t know how to repair bikes, but I told him not to worry and to just get me some fire. I had a spare set of bearings with me, that I was carrying ever since the last bearing failure and just needed to dislodge the old bearing and pop in the replacement. He turned on the acetylene from his welding setup and pretty soon the job was done. He didn’t accept any payment from me and my experience has been that if you work on your own bike in a shop, they feel bad about taking any payment. I was back on the road, with only 30 minutes spent on this breakdown. Be prepared, it’ll pay off. Heading into Rio Grande and bracing for the strong wind blast as I leave the protection of this berm. The sign conveys the message but there’s no palm trees anywhere in sight. 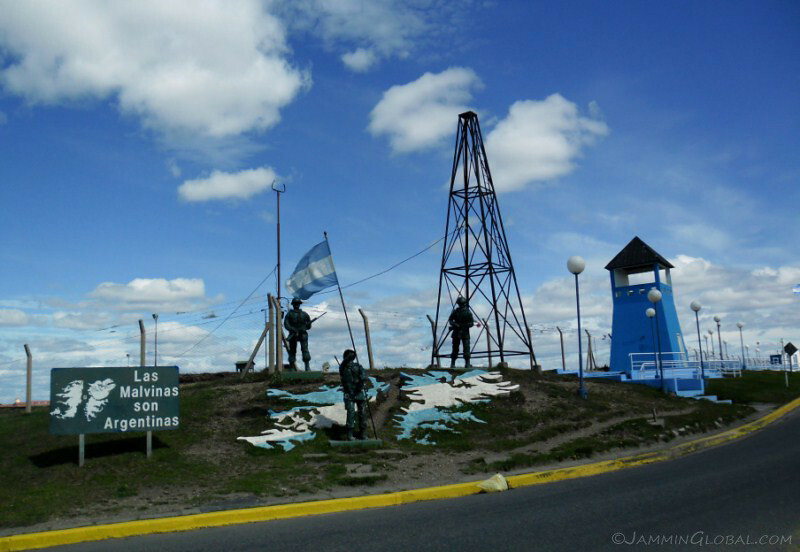 A monument in Rio Grande for Argentina’s continued claim over the Falkland Islands, referred to as Las Malvinas here. They’re a group of islands about 460 km (290 mi) offshore from Argentina and the British have laid claim to them since the early 19th century, much to the continued consternation of Argentines, even though the islanders prefer to be loyal to the UK. In 1982, the failing military government of Argentina invaded the islands in a move to gain the people’s support by rallying up nationalistic feelings. They forgot that Margaret Thatcher (nicknamed the British Bulldog) was in power and her forces soon overpowered the Argentines, leading to the fall of the dictatorship in Argentina and the re-election of Thatcher. 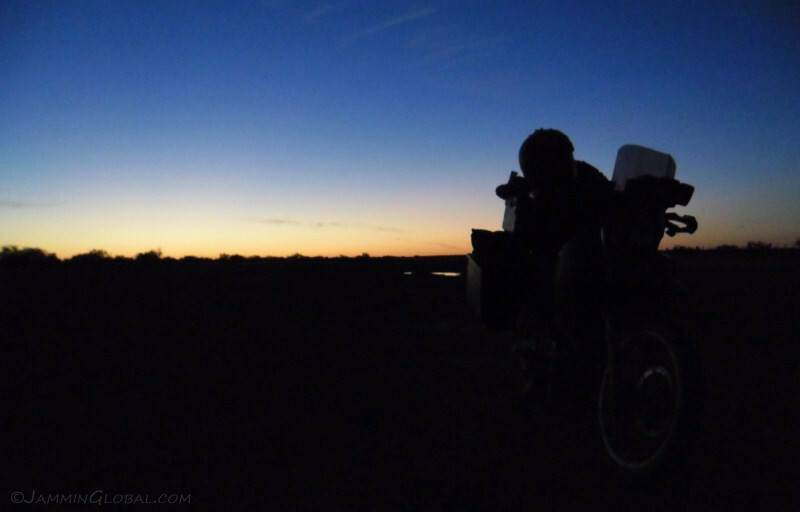 Arriving at the end of the dirt in Tierra del Fuego and besides a small stretch of dirt near Punta Tombo, I knew the next long dirt riding would be somewhere deep in Africa in the coming months. Back on the ferry, saying goodbye to a nice experience on Tierra del Fuego. 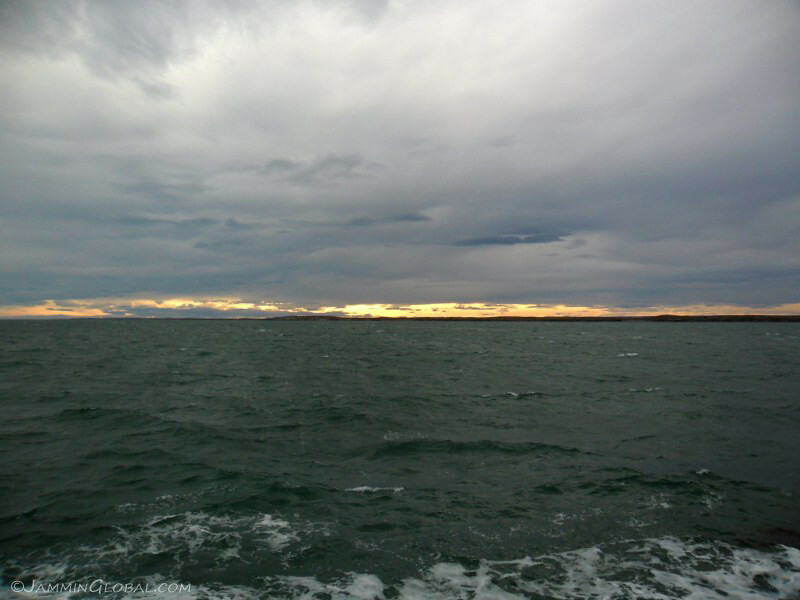 Sunset over the Straits of Magellan. 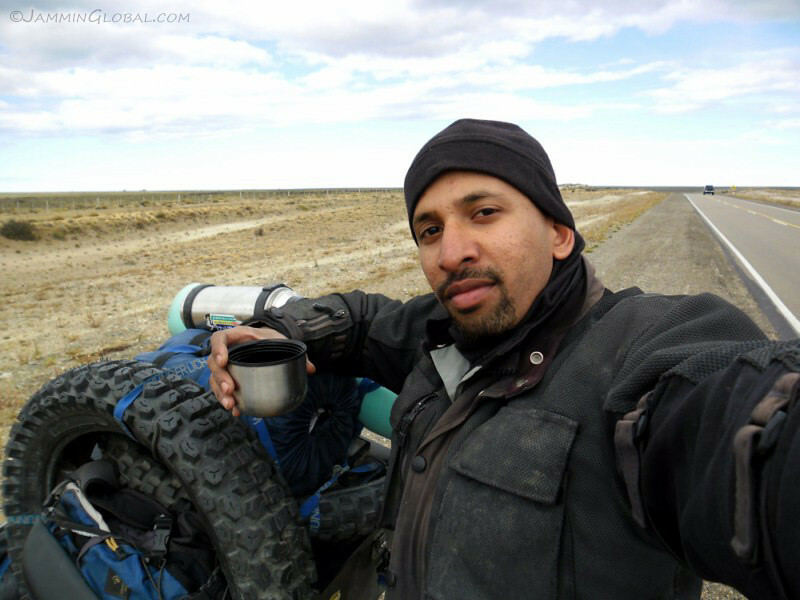 I met a local biker who travels frequently between home in Rio Gallegos and Rio Grande for work and has to pass through two borders (going into and out of Chile) every time he makes this journey. From Punta Delgada, it’s just 55 kms (34 mi) to Paso Fronterizo Integración Austral and my last land border crossing in the Americas. 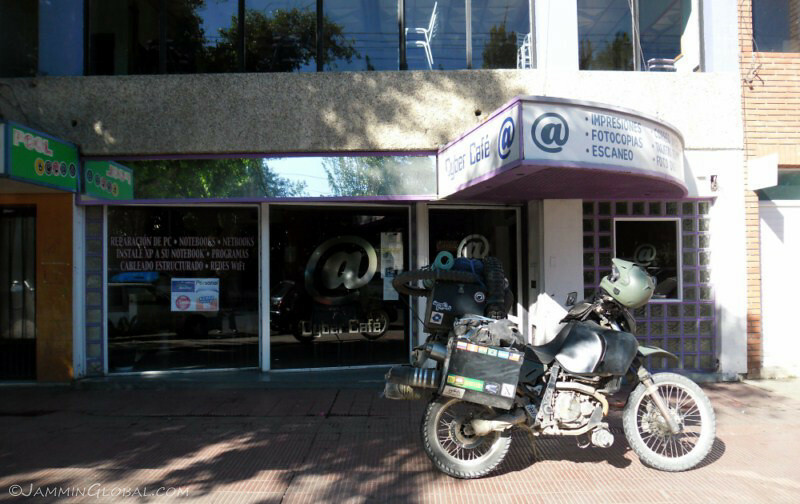 A further 68 km (42 mi) from the border is the bigger city of Rio Gallegos, where I stayed with Daniel thru CS, who runs this internet cafe. He didn’t have any place in his house to host surfers, but there’s a radio studio in the back from where he plays good ol’ American tunes and I put my sleeping bag down there. After a day on the internet, doing some planning for the voyage across the Atlantic, it was time for the long haul to Buenos Aires. 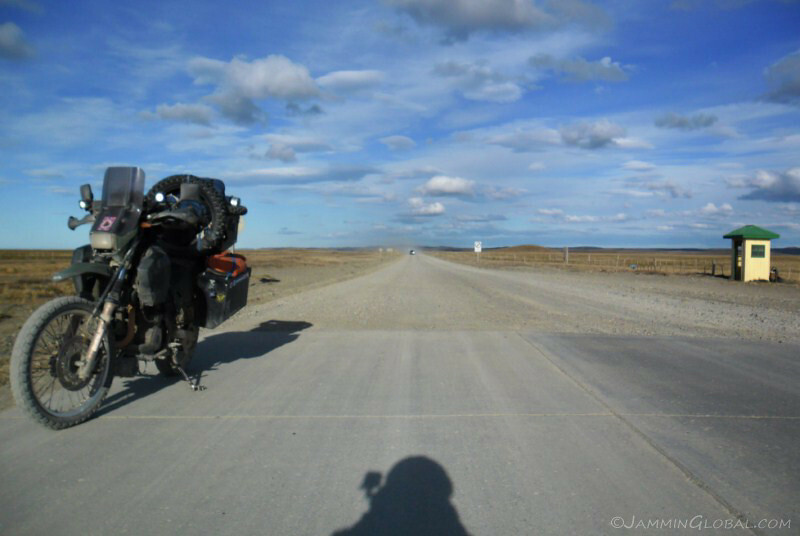 It’s 2,500 kms (1,550 mi) from Rio Gallegos up the east coast of Argentina along Ruta 3 to Buenos Aires and it’s all flat, just like this. Having enough experience with flat, boring riding, I use this time to plug in the audio books and learn another language. Since I was preparing to enter West Africa, I listened to the French language course by Michel Thomas, my secret for quickly picking up a new language. 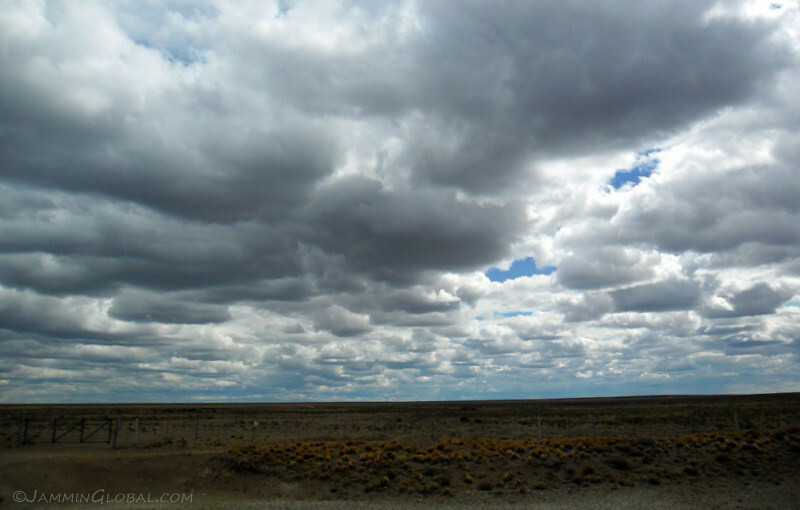 …but mostly, it was just you, Ruta 3 and the wide open land and skies of Patagonia. I became the proud owner of a thermos flask recently and am enjoying some hot tea during a break in the chilly conditions. A man in a truck approached me at the petrol station in Rio Turbio and offered me this thermos. He said he saw it fall off another biker but couldn’t catch up with him to return it. It has Japanese markings on it, but I didn’t come across any other bikers. Some say it’s boring. I say, just learn to deal with it. There’s a lot of uninteresting sights in the world, in-between the mind-blowing stuff, so just figure out a way to deal with the boredom (audio books) and all is well. 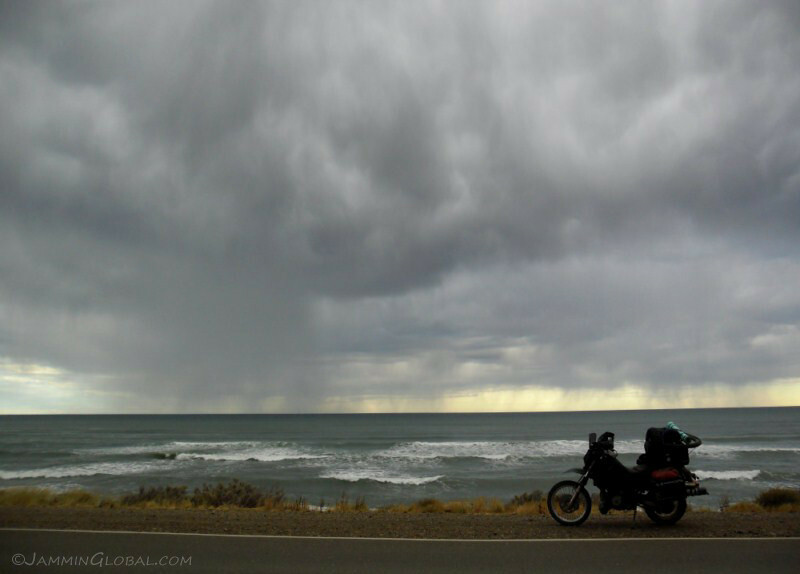 Coming into Caleta Olivia and riding right by the sea, watching some rains move across the horizon. I wonder what Caleta Olivia is all about? Oil! 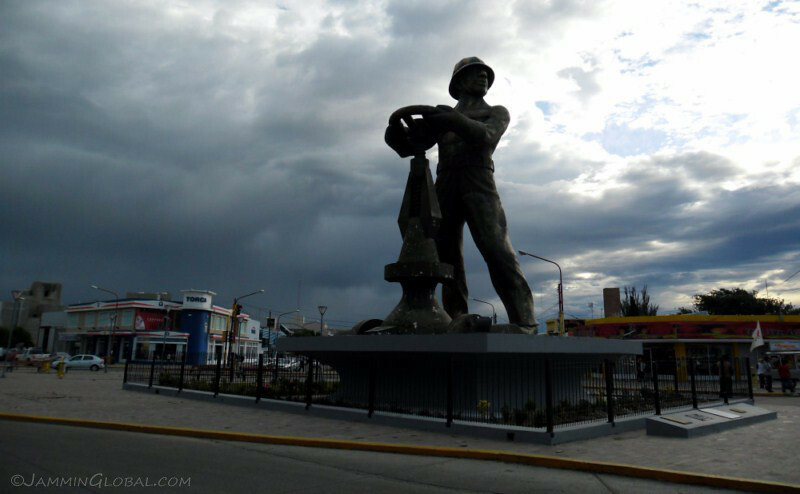 The monument of El Gorosito (the roughneck), in honor of the petroleum industry worker. 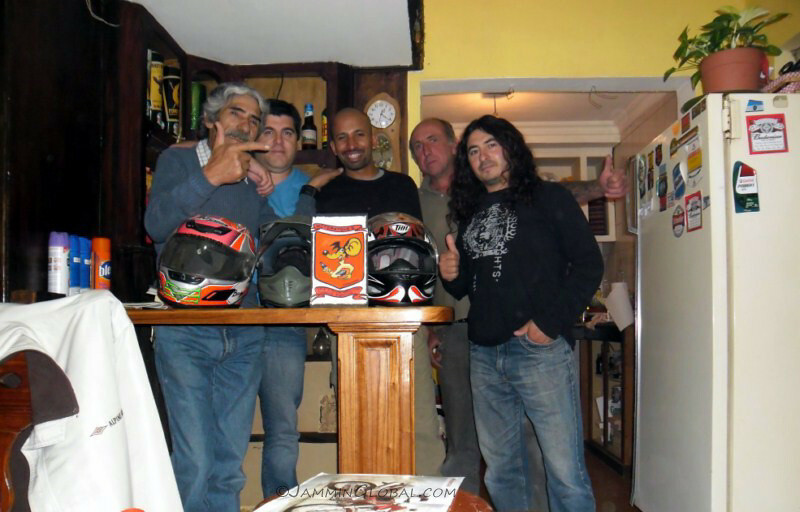 When I stopped for lunch in Bariloche a few weeks ago, a biker from the Motoneros club approached me and told me to get in touch when I swing by his city of Caleta Olivia, so I did so and I got to hang out with a local Argentine biker club. They were mostly riding cruisers and choppers, but bikers are all the same. Great bunch of guys. I camped out in the garden for the night. 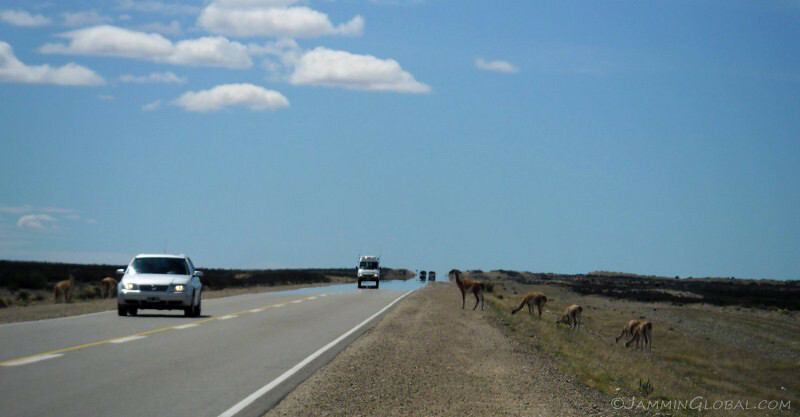 A very windy section of Ruta 3 between Caleta Olivia and Comodoro Rivadavia. So much so that when I stopped to take this picture, a passing truck upset the winds around me enough to unbalance the bike and drop sanDRina to the ground. A passing driver stopped to help me pick her up. 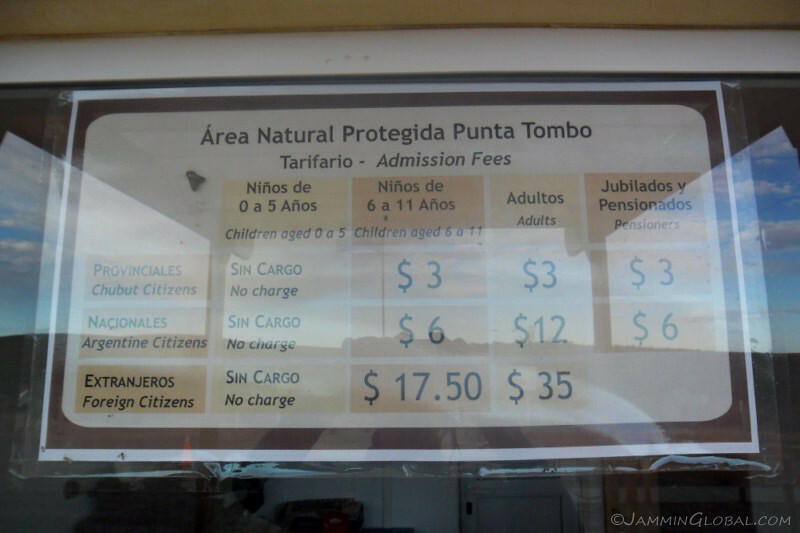 The natural reserve of Punta Tombo is the summer breeding ground of penguins and here’s an example of price discrimination that is common all throughout the developing world. They use the dollar sign to signify the Argentine Peso. So, while it’s only US$8.75 to enter, it’s the feeling that foreigners have to pay 10 times what the local state residents and 3 times what Argentine citizens have to pay that irks many of them. I’ve met many European and American travelers who complain that it’s not fair because in their countries, everyone pays the same. But, I guess it’s a question of how well developed your society is and how much can you afford. Plus, I think giving the local citizens easier access to their natural treasures should give them better incentive to protect these kind of areas. I arrived just as the park was closing at 6 pm, so I decided to camp there and visit in the morning. 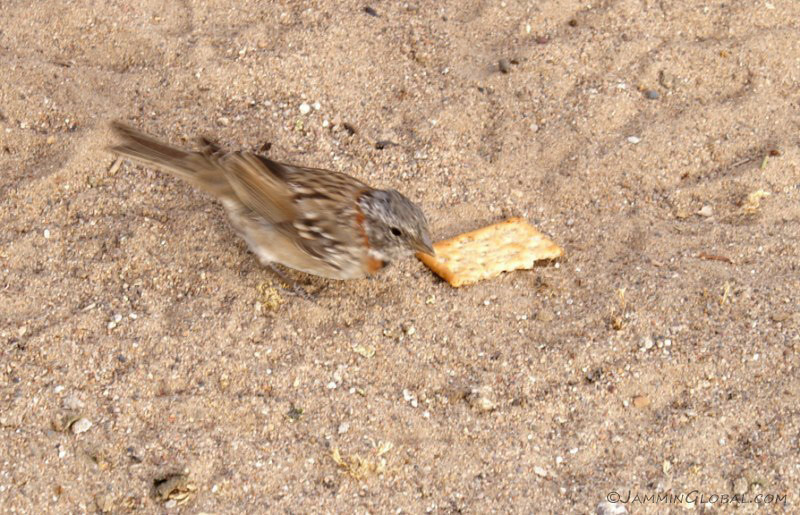 I dropped this cracker and this little birdie swopped in before I could pick it up. There’s no official camping allowed right by the park, but if you’re discreet, the boys who run the restaurant and gift shop will allow you to camp next to this shed. 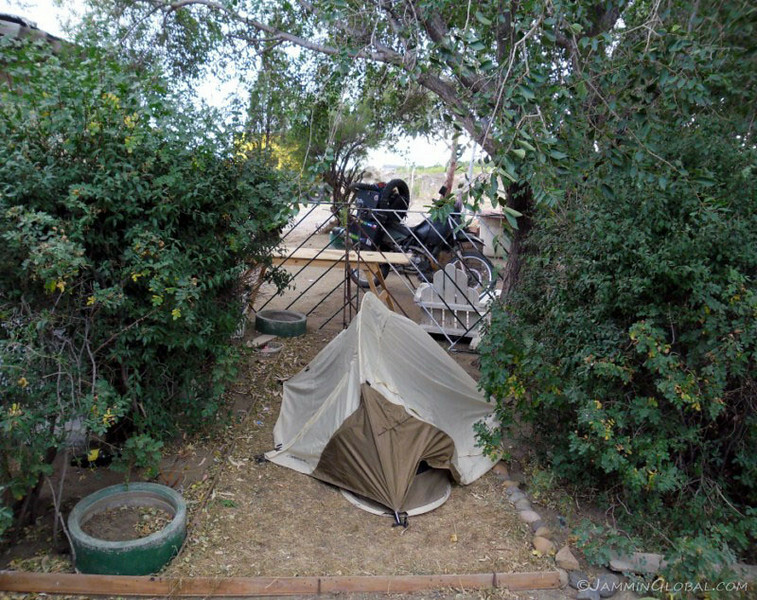 He said he’s met lots of other bikers who’ve camped here. There’s also a very nice bathroom outside the park gate and I took a sink shower there. A fiery sunset just as sol dips beyond the horizon. 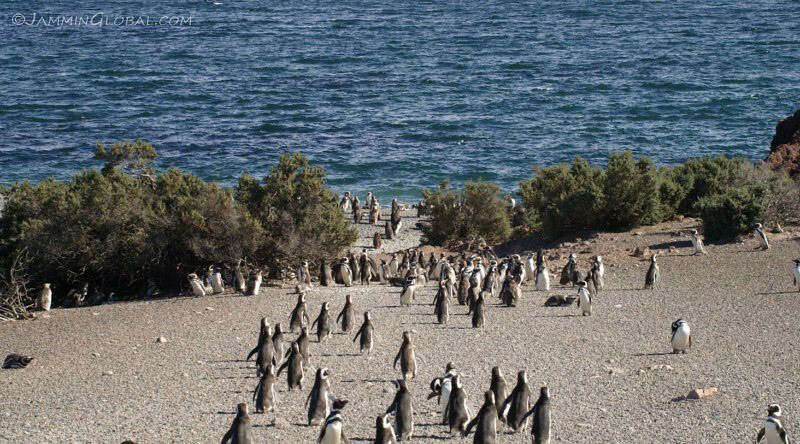 While it’s remote, it’s not at all tranquil, since there’s a million penguins within a hundred meters and they’re yapping 24 hours of the day, making the most of summer. 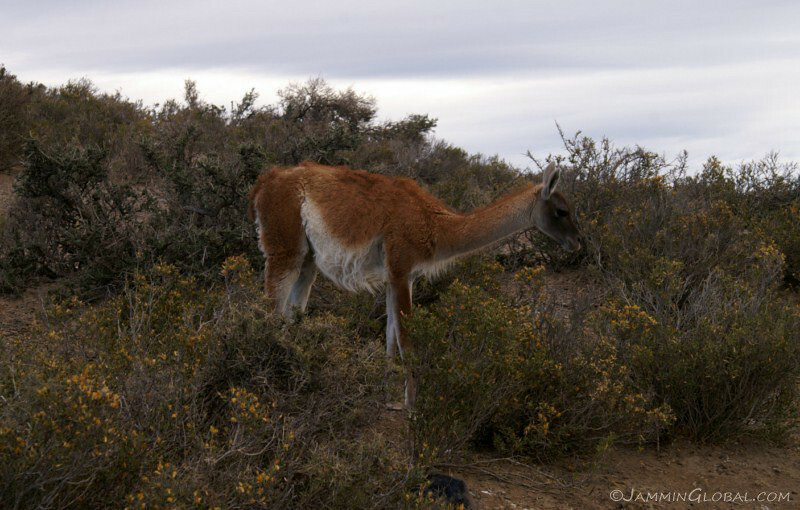 In the morning, I went for a walk around the reserve and pretty soon spotted the first penguins, including a guanaco. 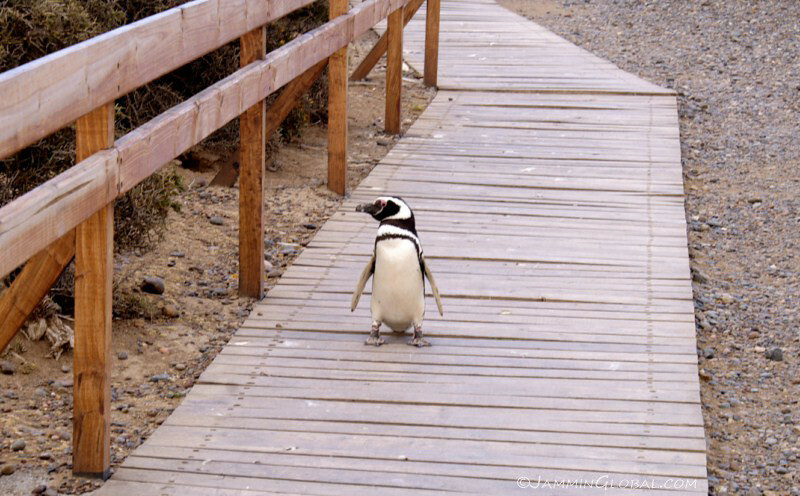 There are boardwalks that we are required to stay on and I guess the penguins can use them too, since this is their home. The nice thing about this experience is that there is no separation between the animals and humans. 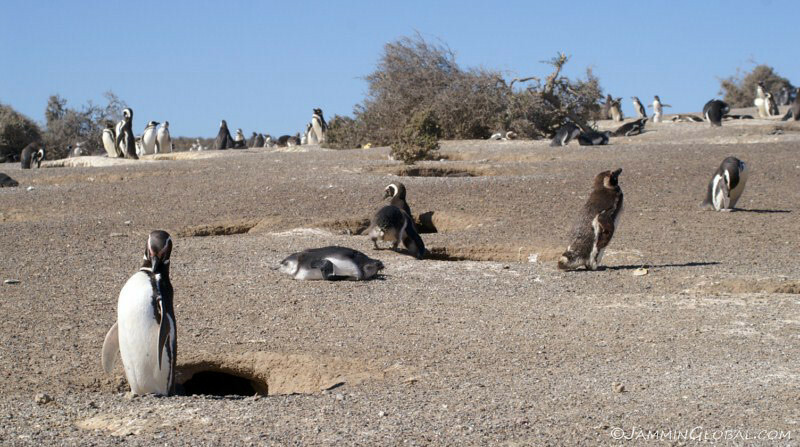 This area has been protected since 1979 and just like the Galápagos, the animals haven’t associated humans with danger, making close approaches possible. However, they are still wild and can attack if they feel threatened and I waited about 10 minutes for these guys to finish up their morning gathering and singing. 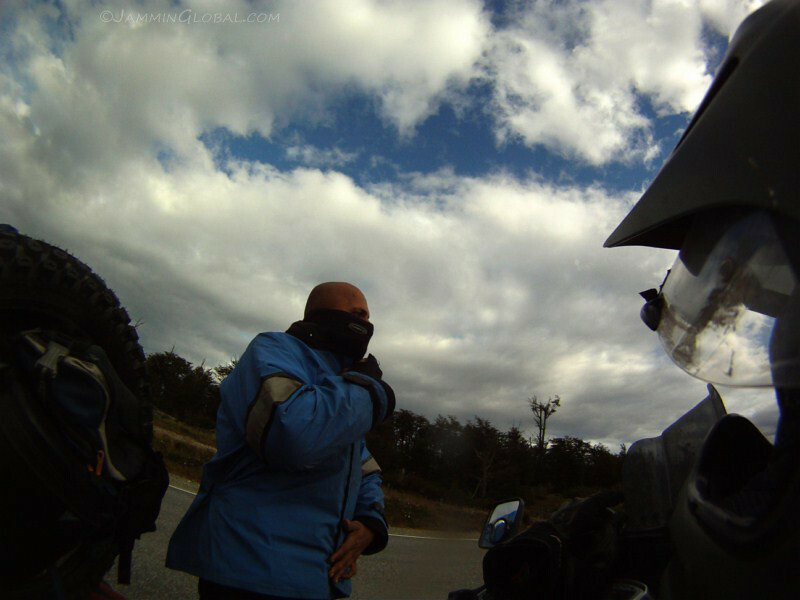 The guy in the front started approaching me and while they’re short at around 50 cm (20 in), the way they walk with their chest out portrays a sense of confidence in taking you on and I retreated and let him pass safely. 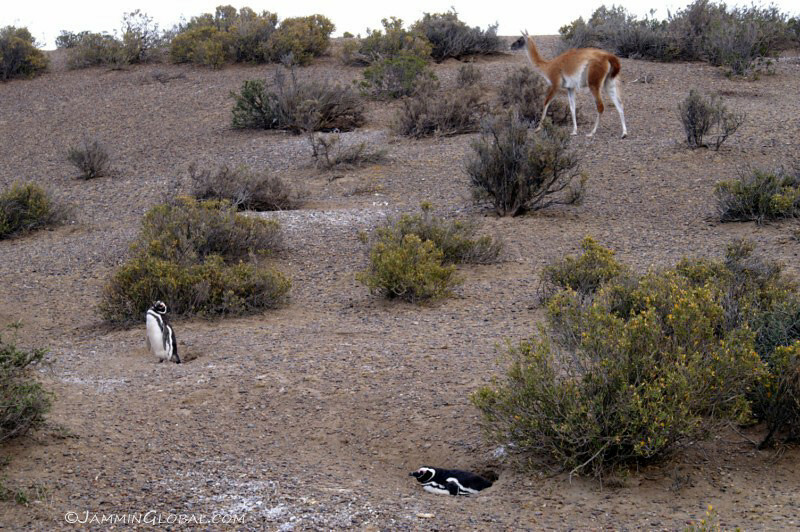 The guanaco looks like such a sedate animal and I wonder how it stands the constant commotion of the penguin colony. 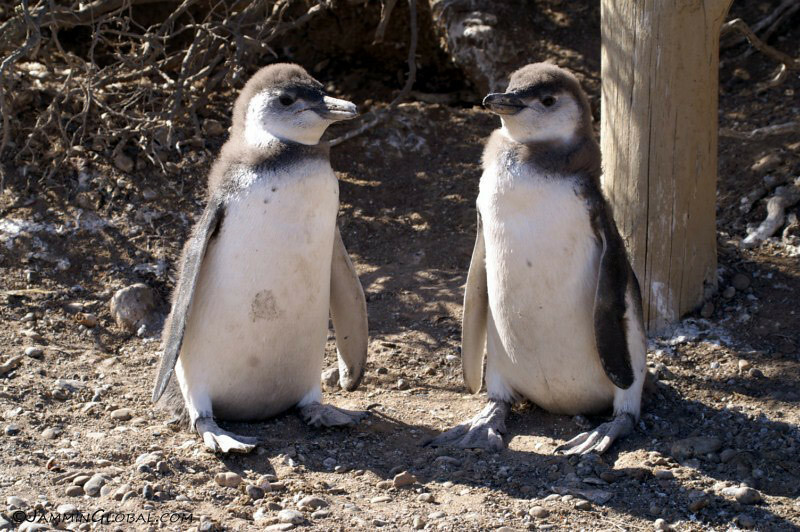 These are Magellanic Penguins and they migrate down from Brazil to incubate their eggs and prepare their offspring for the migration back at the end of summer. 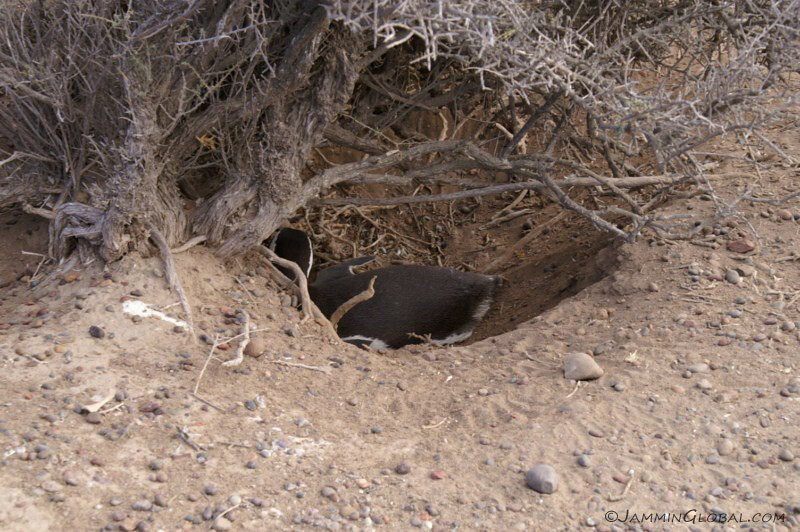 A couple makes a nest in the hillside and each parent takes turns guarding against predators and egg-snatchers, like birds. Ducking in to the nest when all looks clear for a snuggle with the missus. 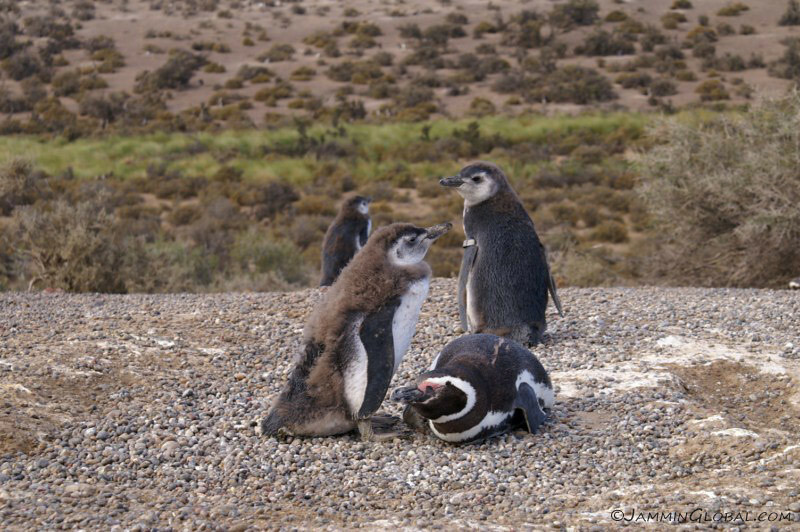 These penguins live up to 25 years and they keep the same mate throughout life. 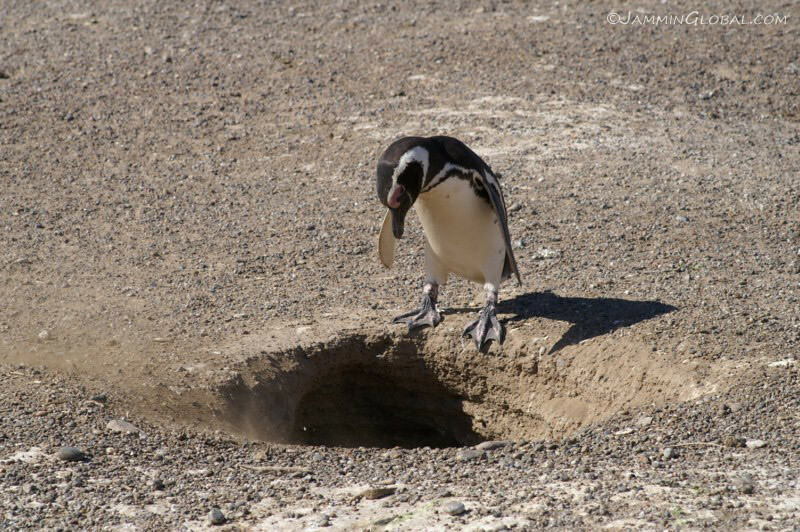 When the breeding seasons starts around October, the male returns to the same nest and waits for the female, who follows his call song back to their home. 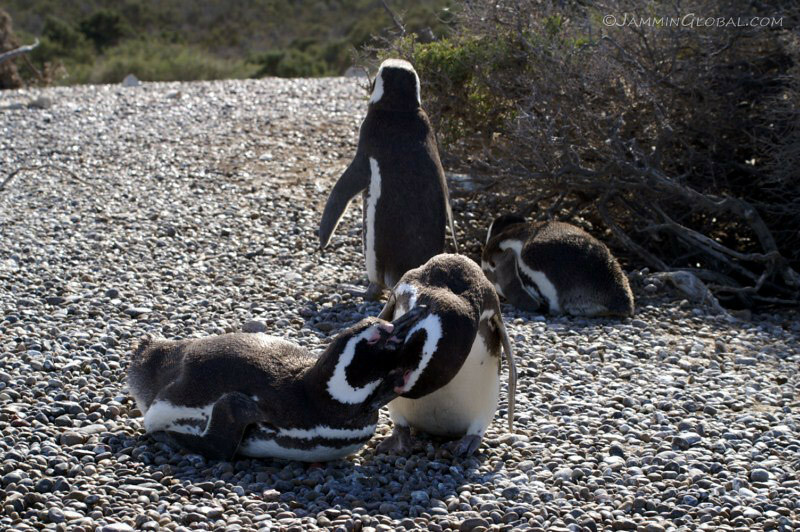 Then, after some penguin magic, two eggs are laid and they take turns incubating until the youngins hatch. A toddler slowly losing his baby fur, that they need only right after hatching and while on land. Before getting into the sea and swimming, they’ll have to lose all their fur, otherwise it would weigh them down. Note the clipped tag on the penguin behind. 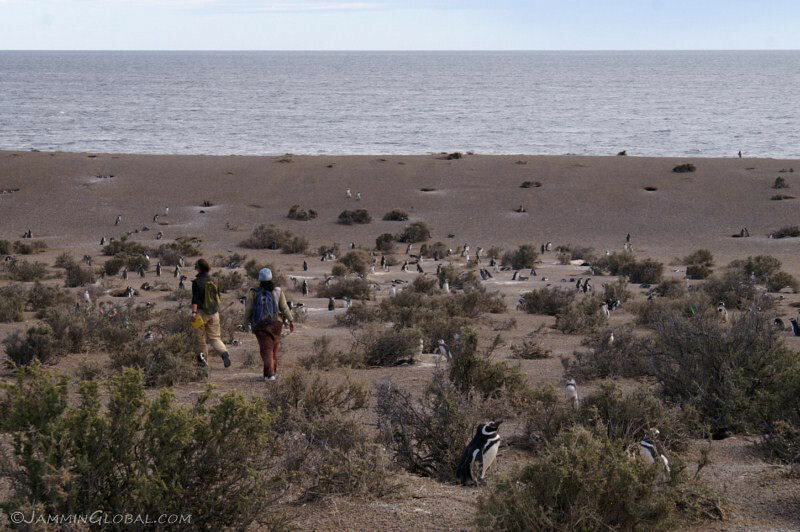 Two field scientists were ahead of me and they were gathering data on tagged penguins. A nice shot of this guy as he stopped to look at me. I was on a small bridge that went over the main route the birds took from their nests to the sea. 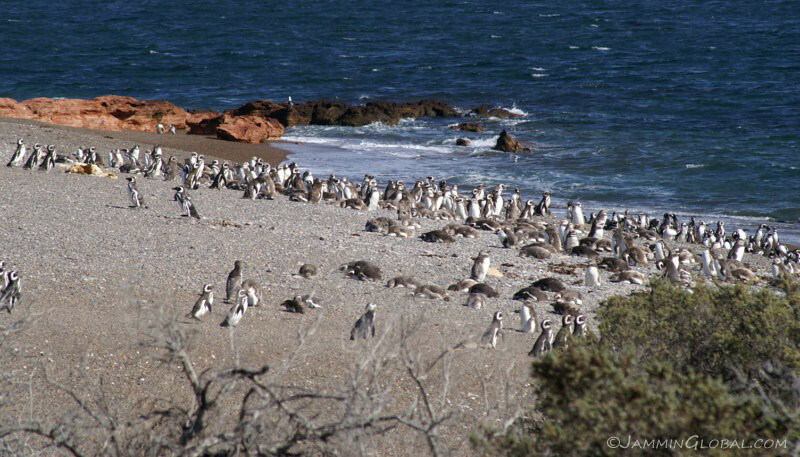 Morning rush hour at Punta Tombo. 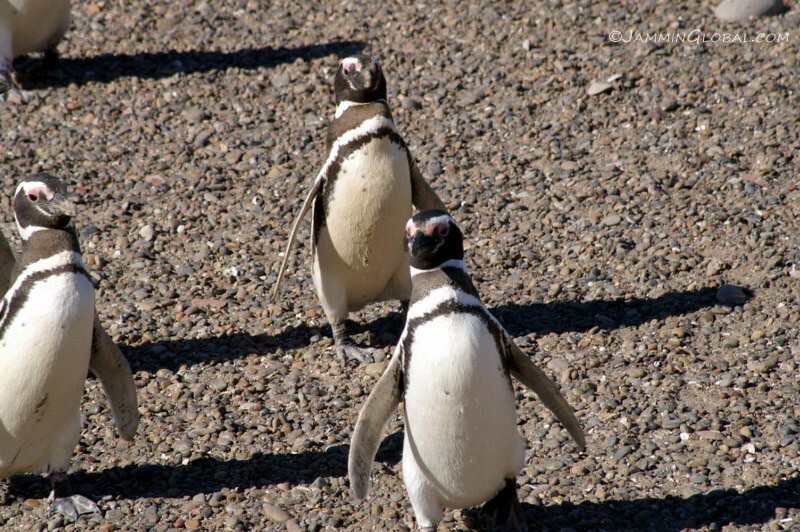 The penguins were all wobbling their way to the open water to catch some food for the family. It was nice to see everyone marching along in the same direction, almost as if they had set streets in the colony, which wouldn’t be surprising considering how many years they’ve been coming back to the same place. Sporting a fashionable new ‘do. It’s amusing to observe them as they march towards the sea, with their stiff wings out helping to smooth out the wobble. 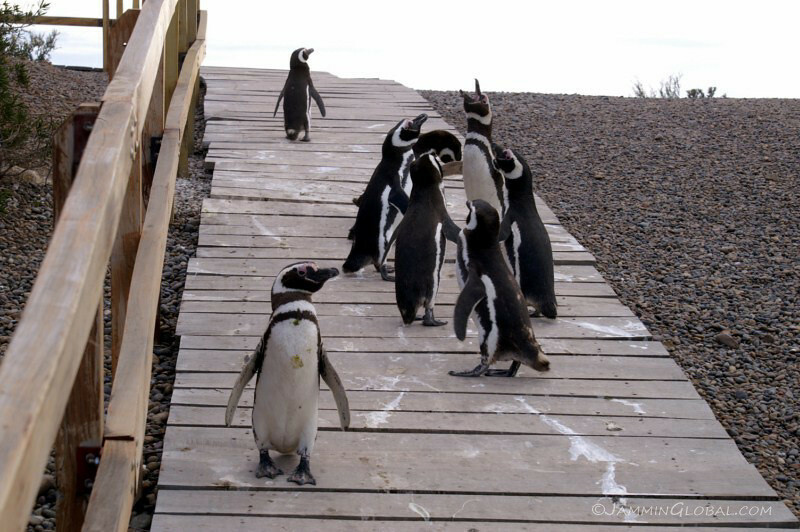 High street of Punta Tombo with penguins going about their daily business. 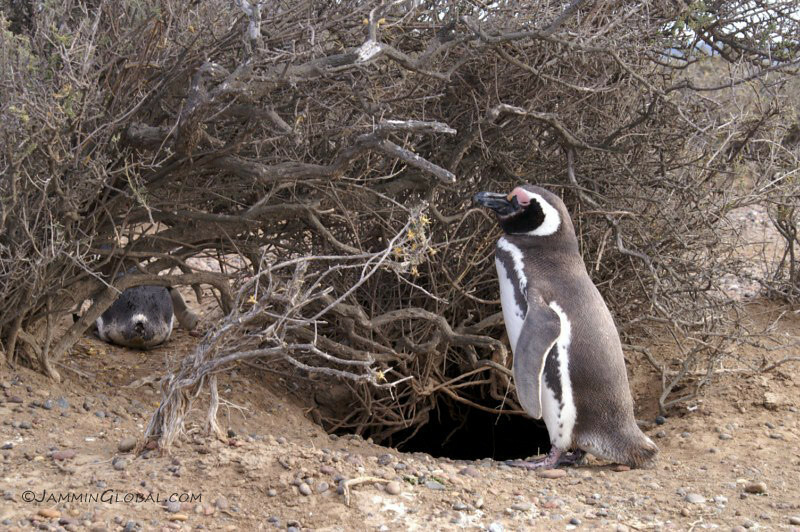 Penguins standing guard in front of their nests. 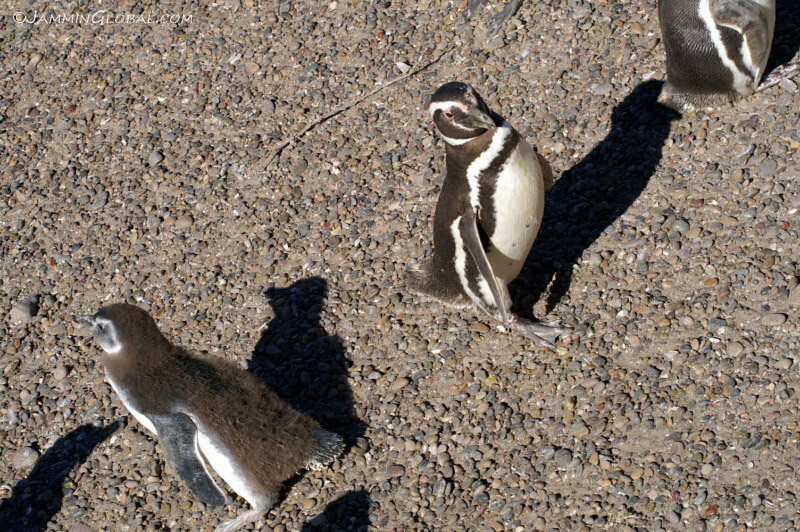 After an enjoyable few hours among the penguins at Punta Tombo, I hit the road for the long haul to Bahia Blanca, 835 kms (519 mi) away. 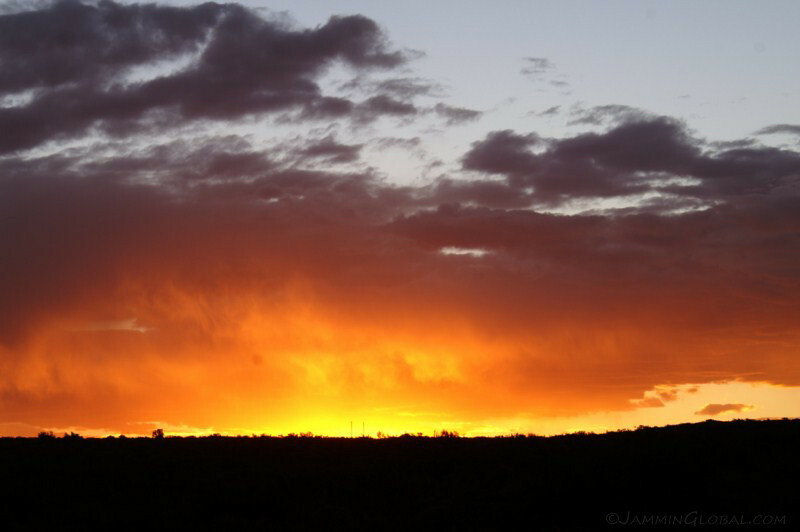 It got dark and the sun set on my exciting few weeks in Patagonia. I spent a full month traversing all over the great land of Patagonia and saw numerous, outstanding natural attractions. If felt rushed, since the distances are great between sites and probably two months would have been more comfortable, but you make do with what you have. 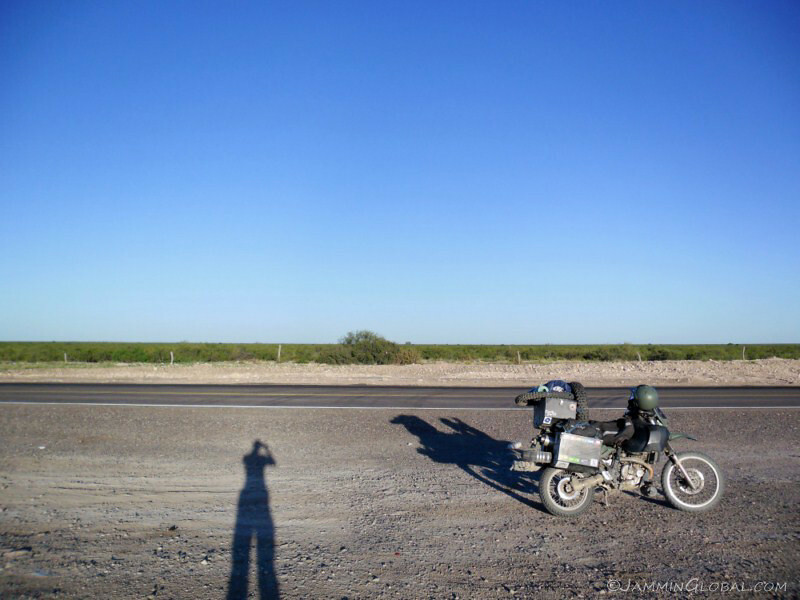 From Mendoza to Bahia Blanca, I covered 8,730 kms (5,422 mi) and felt I had seen all the major and a few minor attractions in this massive region. Of the 34 days here, I camped 15 of them and stayed only 2 in a hotel with the rest CouchSurfing. The camping experiences were fantastic and allowed me to spend lots of quality time with nature. The region is well protected but that also means it’s well developed and packed with other tourists. However, having your own transportation gives you the freedom to seek out places that suit your mood. Once a mysterious land at the far end of the world, now Patagonia is a place to me where I could get a real feel for the beautiful works of art that nature can produce, if we learn to live synergestically and one with it. 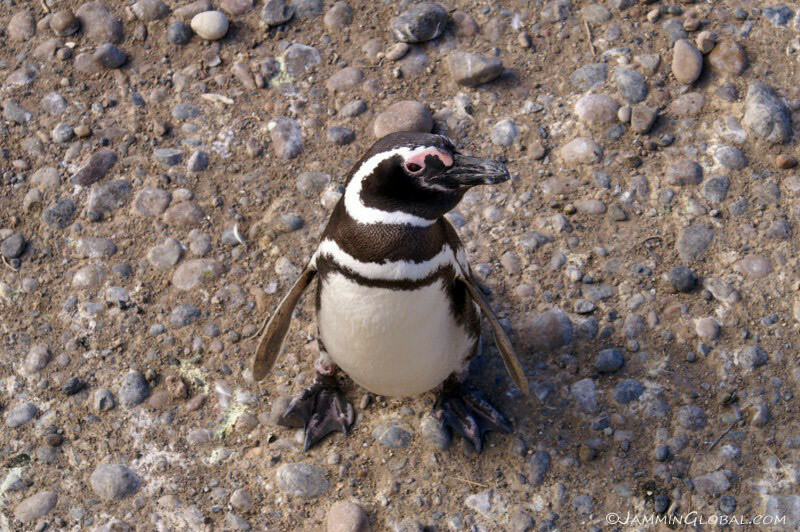 Some excellent shots of the penguins! 🙂 It must have been been interesting, seeing how even at such extreme places, the human ego surfaces to want to lay claim to “the last place on Earth”, literally. 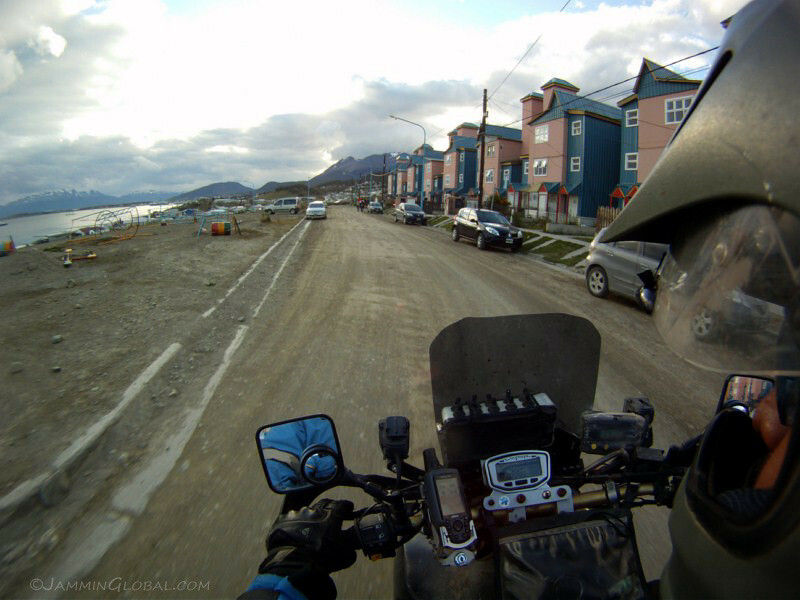 I hear you about not quite feeling the same rush of excitement when you arrived in Ushuaia. 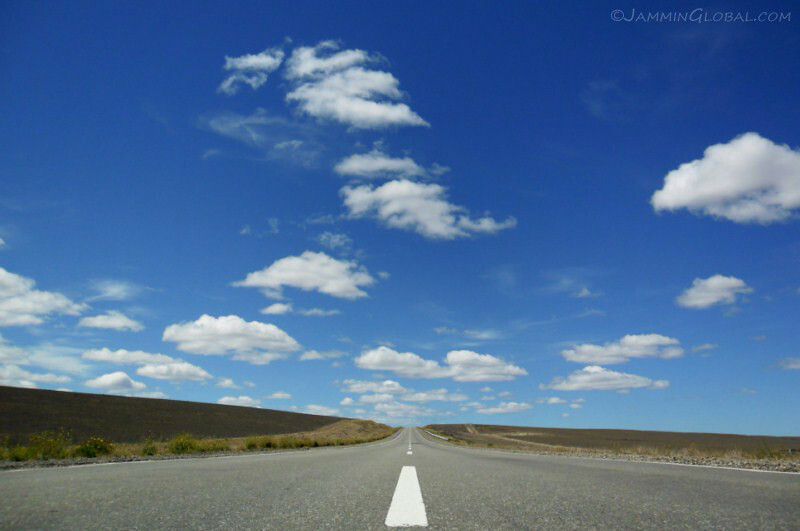 There’s certainly much more beauty on the open road, as evidenced by your photographs. Thanks, Rohin. 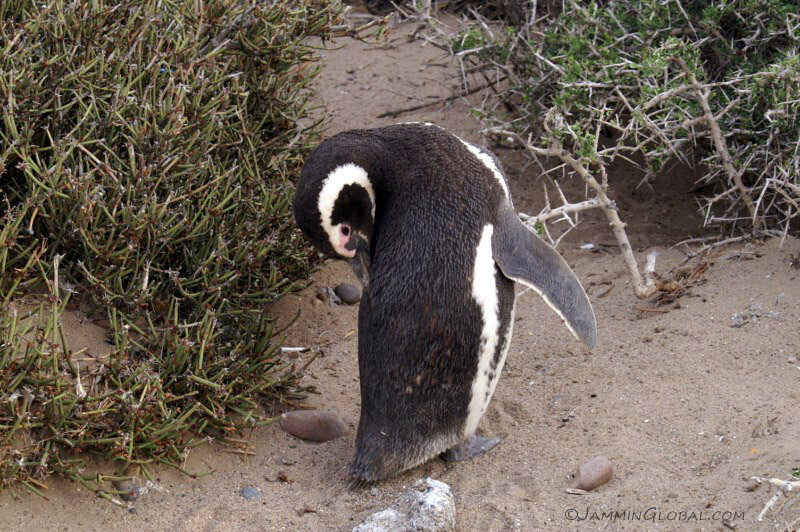 Penguins have so much character.